Thanks for saying so, evil twin. It helps to know I am still on the right track and that someone is still reading with something like enthusiasm. There's a lot going on in the campaign right now, two more battles to arrange (delayed only by the busy lives of me and my players), and I am always working on future story pieces. Once we get the first battle done I can do the end of season phase, which should have a number of illustrated stories in it like last time. Biagino was met by the Lector’s secretary as soon as he returned to the camp, to be told he was summoned to an audience with the Lector. He had been out with a small company of militia scouring the land for supplies, there encountering two Viadazans so terrified that they could barely explain themselves. They spoke, incoherently, of the fall of Viadaza, and of the dead rising to kill the living. In truth, their vocabulary was inadequate to describe the horrors they had witnessed. At the time Biagino had prayed that they were simply fooled by circumstances, and were describing events in a village, a nightmarish encounter with a scouting company from the vampire duke’s army, or maybe just repeating what some mad prophet had dreamt. Yet as soon as Biagino saw the secretary’s face he knew that the two peasants had, in their own broken way, told the truth. They had arrived at the Lector’s tent, where their spiritual leader was still questioning a series of witnesses who had fled the city. Before him was a bedraggled fellow, who at first sight might be taken for a country vagabond, but his rags were the remnants of city fashions and his beard had recently been trimmed in the style of the swaggering city watch. The Lector was standing, which was unusual for such a situation as this. One would expect him to be seated upon a throne, while those being examined or bringing petitions humbly stood before him. It was immediately obvious, however, that the Lector was simply too agitated to sit. He was pacing back and forth, and at this moment asking a question. “And then?” asked the Lector. The Lector waved the man away without even looking at him, and another witness was brought before him, this time a young woman. Her skirts were so filthy she looked to have waded through a mire. Of course she had, thought Biagino. What would one not be willing to suffer to escape the clutches of an army of walking corpses? The Lector’s face registered disgust. Perhaps, thought Biagino, he remembers the foul miasma we all breathed in the battle? 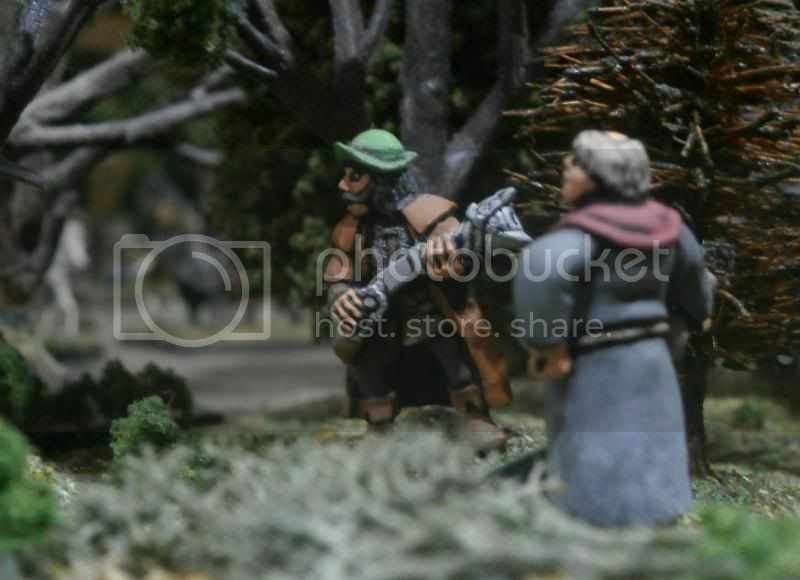 The girl was led away to be replaced by yet another refugee, an old, bent, grey-bearded man, who must surely have been helped to leave the city for it was plain he could not have run away himself. “This man saw that which came from the crypts,” the priest by his side announced. “Which crypts?” asked the Lector. He looked doubtful and Biagino knew why. The city’s ancient crypts were protected by powerful wards - locked by decades of prayer so that Morr’s hand alone held the key. He stopped, as if he were merely telling a bed time story to a child, and intending to create suspense. Once again, no-one complained, they merely wanted to know what he saw and cared not a jot how he told them. Biagino had heard enough. 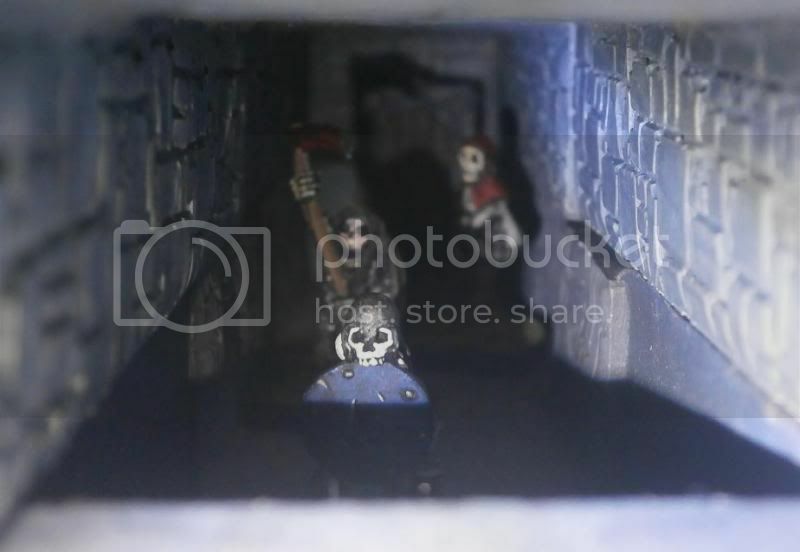 Ghouls, zombies, skeletons: it was the Battle of Pontremola all over again, but this time engulfing Viadaza, and the undead had won. He felt sick. It was not fear that made him so, however, but frustration and doubt. Had he not done all he could to serve both Morr and Tilea? He had raised an army and fought a mighty foe. Yet all for nothing, for now the undead were both north and south of them, and the army was broken and dispersed. He had lost his home, the Ebinans had lost theirs, and now the Viadazans too. Would the whole of Tilea succumb to this wickedness? Had Morr given them victory, hard won as it was, only to abandon them now? Very well done. 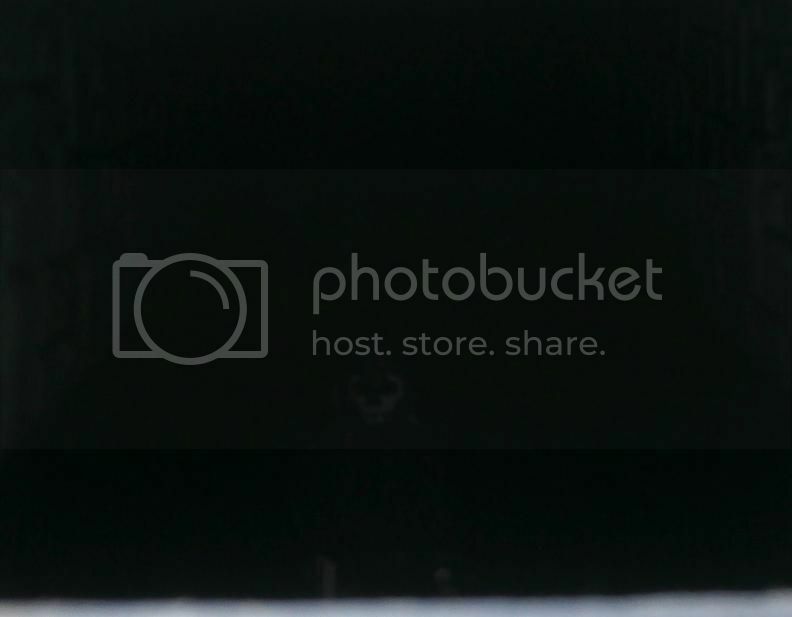 Picture 6 is very dark, though - at least a real inkling of a face would be nice. I'm sure there is at least an inkling of a face there - it had to be just not quite visible but definitely something there, for that was what the character described. Besides - Picture 7 is exactly the same set up as Pic 6 but with my mobile phone torch shined into the corridor! I may be the first to ask, but I'd really like a painting tutorial. I never answered this before, mainly because I was too embarrassed to write how very, very simply my technique is: Using enamels - paint black undercoat, leave several days to dry thoroughly, then paint cells of colour on (leaving black outline around everything), then lighten some of the colours and add a touch of the lighter shade here and there. Last, tidy up any black lines that got splodged with paint. That's all there is to it - the only other major technique I use is doing big batches of figures - 40 belts, 40 shoes, 40 blades - etc. I've not changed my painting method in 26 years!!!! The last episode reminds me a bit of the Graveyard in the Witcher. I am ashamed to admit ignorance of 'The Witcher'. I shall begin a quick google hunt now and see if it is film, book or comic. Or something else? Edit: Oh, never thought of that. It's a computer game. I've never been a player of video games (well, I used to play Defender in the 80s). My boys are growing up, though, so soon I will surely be dragged kicking and screaming into awareness of that particular aspect of modern life. It was perhaps true that any other Tilean ruler would by now have been raging about the state of affairs, shouting in frustration at his council, complaining at the dishonesty, laziness or cowardice of mercenaries. Not Prince Girenzo of Trantio, however. His demeanour never seemed to alter, and only the fact that he had been enquiring up to four times every day for news revealed how the matter weighed upon his mind. 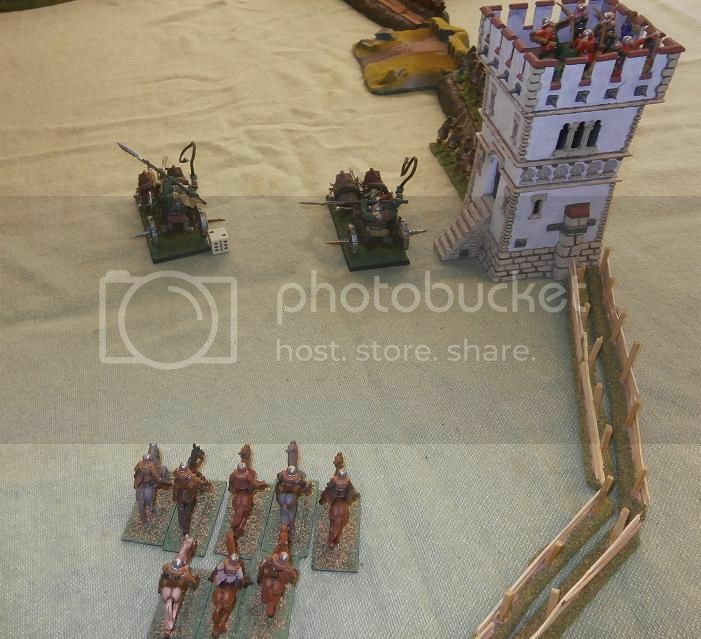 The condotta mercenaries of the Compagnia del Sole had had all the time they needed to strike at Pavona, indeed time enough to have returned laden with loot. Yet they were still out there, skirting around the realm of Pavona like a scavenging fox looking for a cunning opportunity to strike without risk to itself. Every report they sent to the prince gave a different excuse. First there was the threat of the Pavonan army, reckoned to be far greater in strength than the Compagnia. Then there was trouble with moving the artillery. Then it was camp fever and the flux. Eventually, news came that they were at last to strike at the newly developed settlement in Venafro just east of the conquered city of Astiano. Since then, nothing. That is until now. The prince was mounted and armoured, engaged in military exercises with his gentlemen in the open field to the east of the city. It was a bright, blue sky day and he and his knights, bedecked as they were in plumes and their elaborately fluted armour, atop brightly barded horses, looked as if they had stepped out of the pages of a book of heroic tales. 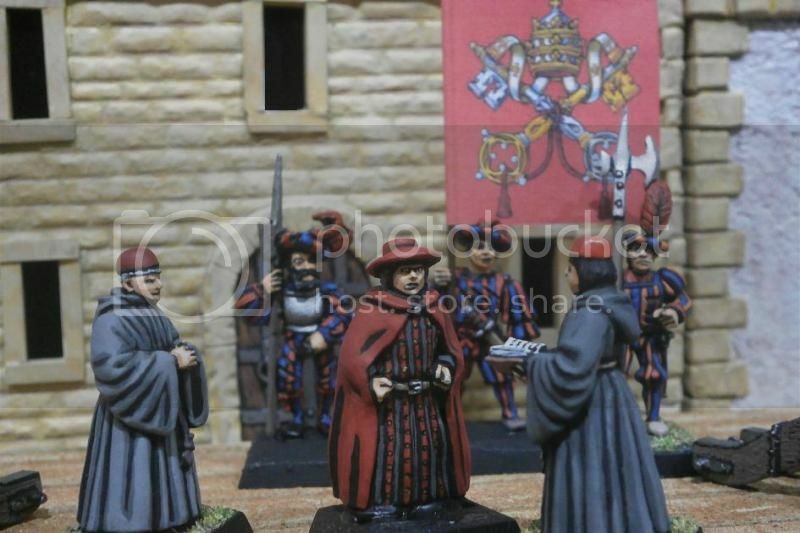 A little body of noblemen and officers, the prince’s ever present councillors, stood chatting to one side, for the most part clad in the traditional burgundy and green of Trantio. Upon sight of an approaching party, the prince had halted, ordering his men-at-arms to form a rank. 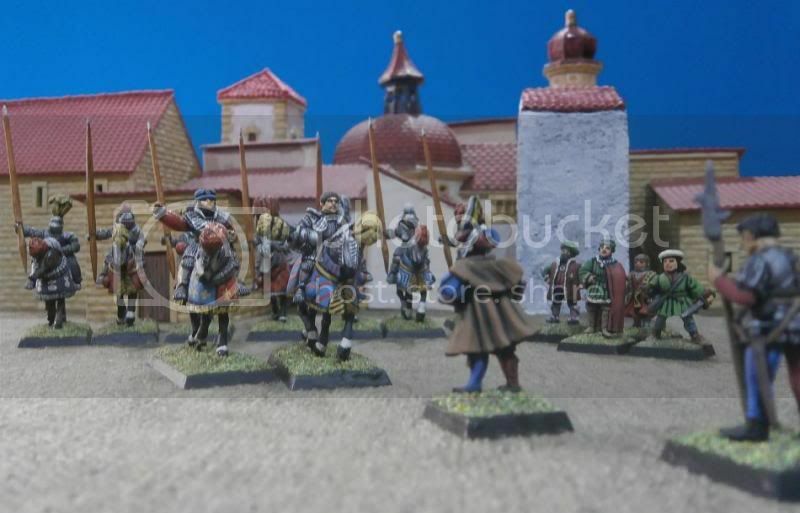 He removed his impressively plumed helmet and watched as one man stepped forwards from the rest of the newly arrived company, a Compagnia del Sole captain called Duilio Citti who had brought the first set of excuses to be presented to the Duke over six weeks ago. The captain bowed, apparently a dab hand at that particular courtly etiquette, and then awaited the prince’s command. “Do not tarry, but say what you have come to say,” the prince ordered in his quiet, clipped voice. Whether a felon was being dragged before him for judgement or a newly acquired horse was being led in for his inspection, the voice was always the same. The prince did not respond immediately – it was not his way to rush. Like the others there, Captain Citti simply waited. Silence fell, interrupted only by the snorting of one horse and the pawing of another’s hooves at the dirt. The captain wore a travelling cloak of soft leather over his blue and red tunic and hose. His own cap sported yellow and white feathers - the colours of the Compagnia’s Myrmidian emblem. The little company behind him, also garbed in blue and red accentuated with white and yellow, looked grimy and tired. Some had removed their helmets like peasants might remove their caps in front of their betters, but in the mercenaries’ case, they did so only for comfort. Indeed it would normally be considered inappropriate for soldiers to doff their headgear in the presence of officers, or to adopt such a lazy posture. Veteran mercenaries, however, went by different rules. “How far behind you are they?” asked the prince. “Let’s hope the people of Astiano do not realise you don’t actually intend to attack,” said Sir Gino. Sergino walked towards the prince himself, eliciting smirks from the mercenaries and annoyed looks from the Trantian councillors. He proffered the paper but Prince Girenzo ignored him. One of the councillors stepped forwards and coughed to catch Sergino's attention, then beckoned him over with his finger. Feeling guilty about not putting the historical background I gave to the players of this campaign into this thread, I have now done so. You may simply want to read the stories as they come out (which is what I thought originally would be the best way to do this thread), but some of you might well want to get a better understanding of all of this, and the history of the region is a good way to do so. Also, I think I have a new player joining the campaign (replacing an inactive one) and thought it would be better to have all of this stuff chronologically placed in one thread, so that he can get up to speed more easily. Due to character limits, I have slotted the history into three earlier posts, shifting some other things around. 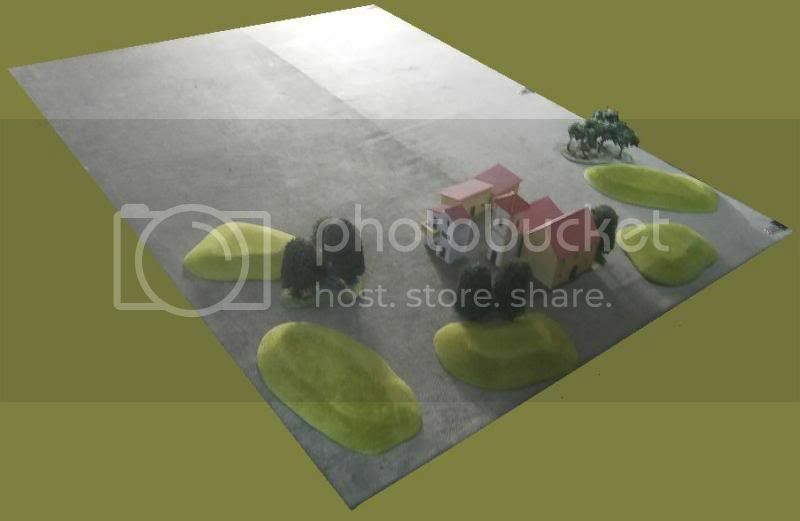 I have added some photographs and maps from the previous campaign which are directly relevant to the historical account. Next up, later tonight, an account of religion in the human realms of Tilea. This will be lifted from an earlier piece in a previous campaign. Then, over the next few days, a new battle report is due, which I am working on right now. Loved the orc & goblin forts! Where'd that bridge come from? And the towers on either side? Great read on the history, too! Thanks GP. I am glad I put the history piece in now. The fort was made from coffee stirrer sticks. Always grab a handful, not one! The bridge is a 1970's 1:32 scale (i.e. 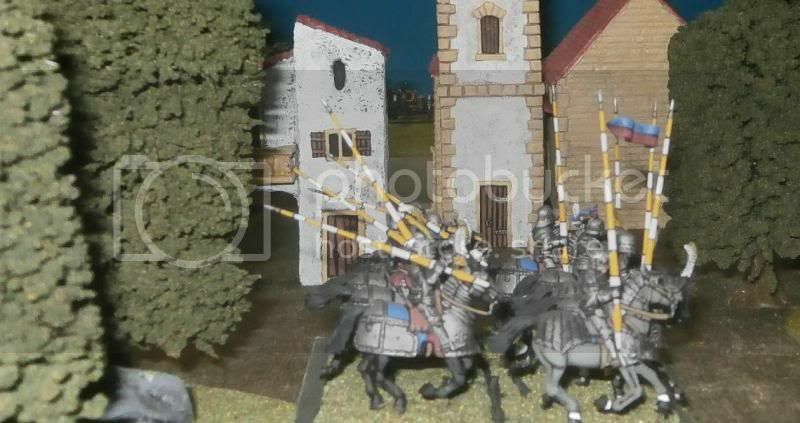 54 mm) WW2 Airfix model, and the towers are 1970's Timpo knights castle towers. The lesson to be learned here: never throw anything away! A Short Treatise on Religion in Tilea by Master Lamberto Petruzzi of Astiano, Presented to his Grace Duke Guidobaldo Gondi of Pavona in the Summer of IC 2401. May the glory of Morr shine wisdom into the hearts of all good men. No less than any of the human realms, the worship of the lawful gods plays a part in almost every Tilean’s life. Public and private beliefs cultivate a healthy fear of the immortal deities, bolstered by tradition, law and the powerful authority of churchmen, both spiritual and worldly, and not least the mysterious workings of the gods themselves. The world of men is so ordered that each has his place in the great scheme of things, authority stems from the gods down to princes and the highest clergy, then to noblemen of all ranks, further to gentlemen and priests of all degrees, to citizens and merchants, and finally reaches common labourers and peasants. Each bows only to the powers above them. As the gods hold council, presided by he who will one day rule them all, so too great princes must treat with other princes, clergy with clergy, nobles with nobles, and so on amongst peers downwards through creation. But the exercise of faith does not always yield peace and harmony, for it has so often been expressed in conflicting ways. Noble priests conduct high ceremonies in the grandest temples accompanied by serene hymns, yet outside ranting preachers stir the common people’s fears with apocalyptic warnings to conjure dire visions and elicit the much less musical sound of frightened wailing. Our realm also boasts numerous, humble, godly folk who only quietly complain about nepotistic priests, and ascetic hermits whose lives contrast starkly with the wayward ways of hedonistic clerics. And as the wildest men of faith openly bare the scars of their self-scourging, the most gentle simply give offerings so that priests may pray for their souls, and the rich gift gold to build temples and so ensure their names are ever after remembered. The three most influential churches remain those of Morr, Myrmidia and Mercopio – commonly know as ‘the Three’. When, upon rare occasions, an edict is jointly issued by the rulers of these churches, it is sealed with the symbol ‘MMM’. But of course the most favoured church in Tilea is rightfully that of Morr. It came to prominence a little over an hundred and fifty years ago, when Morr was finally recognised by all truly enlightened Tileans as outranking every other god. It was then, and is now, accepted that as all mortal things must die, and as Morr rules over death, he should therefore be the most respected and feared of all the deities. Furthermore, as the other gods rule over mortals, all of whom will ultimately yield their souls into the Morr’s care, then the gods themselves surely recognise his supernatural authority over even them. It is Morr who must be placated if one’s soul is not to suffer eternal torments in the afterlife. Those who, by neglect or wilfulness, fall out of favour with him are doomed to become troubled spirits - sorrowful, fragmented souls dwelling in the shadows of the darkest nights. Or worse, they might be resurrected by wicked practitioners of the black arts as walking corpses, forced to un-live a fate most definitely worse than death. So it is that the church of Morr has always been gifted the greatest bequests and offerings, its holy ceremonies attended by the greatest crowds. Wealth begets wealth, for as the church acquires land so to it acquires rental income; as it acquires gold, so too can it invest in enterprises to yield ever more gold. Now its ornate edifices tower above those of other temples and churches, its priests are adorned more richly, and its influence in worldly affairs is much more widely felt than that of any other church. All as it should be for the greater glory of Morr. 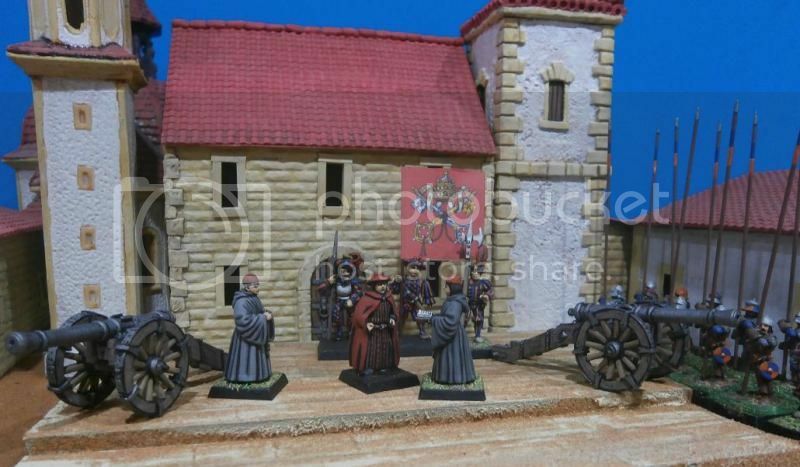 The Tilean church of Morr no longer concerns itself solely with funerary rites as it did in the distant past and still does in the northern realms of the Old World, instead its temples ring daily with the sound of chanting and hymns as cannons and choristers petition Morr to protect the souls in his care. Few Morrite priestly orders garb themselves in the old, traditional black robes. Most wear a grey habit, with dark red surplices, hoods and caps to represent the colours of the late evening sky, a sign that they alone can intercede between mortals and the god of death, between day light and dark night, between life and death. Whether their robes are plain linen or wool, silk or satin, adorned with gold braid or silver lace, they remain outward signs of the role they play in every mortal's passage into the afterlife. Certain ignoble events have undoubtedly shaken the Morrite church in the past: the most famous scandal being the shame and dishonour brought about in IC 2343 by Frederigo Ordini. This Arch Lector and overlord of Remas hatched a diabolical plot with the enemies of all mankind, the ratto uomo, and sent many thousands of brave men to their deaths in a false war. Yet although this did have long term consequences in the realm of Remas, as well as amongst the princely rulers of the city states who innocently sent their own soldiers to support the doomed venture, it did not shake the beliefs of the vast majority of common Tileans. This is mainly due to the simple fact the church of Morr has never claimed that individual men, even priests, lectors and arch lectors, are infallible. Frederigo was declared insanely wicked, the victim of spiritual assault by demonic beings whose greed and pride had caused his terrible fall from grace. This decree did not quite satisfy all Morrite clergymen, however, and the renowned, ranting reformer Sagrannalo of Trantio used the doubts concerning the true nature of the church’s higher clergy to gather an army-sized mob of schismatic, peasant followers, who set about ‘cleansing’ temples. (In truth, merely ransacking and robbing them.) Once this violent and misplaced reaction to the Frederigo plot was finally dealt with, the church both regained its proper place in the hearts of men and resumed its growth. According to the established Tilean churches’ laws, the rulers of the three main churches - the arch-lector of Morr, the arch-priest of Myrmidia and the high priest of Mercopia - wield great influence when acting in concert. They can command the investiture of princes. They can excommunicate heretics, even rulers, theoretically removing all authority those princes might claim over their subjects. They can declare holy war against states, clans or peoples serving unlawful gods. This traditional cooperation is still practised for matters of great import, involving the great nobles and principalities, but in many matters of a more petty nature, the Morrite arch-lector rarely concerns himself with the formal ceremonies required to express other churches’ willing acceptance, knowing full well that the Mercopian high priest and Myrmidian archpriest do not care to go through the whole rigmarole upon every occasion it is theoretically required. If these church rulers would also accept the Morrite arch-lector’s rightful authority as the direct servant of the most senior deity, then such ceremonies could much simplified to become merely a matter of acknowledging and accepting of the holy church of Morr’s rulings. The church of Myrmidia is very well respected in Tilea, and indeed there are few soldiers, whether militia or mercenary, who do not pray to her - although many only remember do so when bloody battle is imminent. Many priests and priestesses of Myrmidia still wear the traditional robes of white and red, but there are several well established regional orders who garb themselves in different colours, such as the Reman Myrmidian clergy in their greys, yellows and greens. Mercopio could be considered the god of day-to-day life for a vast number of Tileans, as nearly every purchase or deal involves a whispered prayer to him, and his name is invoked upon deeds, bills and receipts. Mercopian clerics are to be found residing over civil law court matters such as inheritance, sales, mortgages, endowments, leases and trusts, as well as matters of debt, foreclosure and bankruptcy. The goddess Verena is of course invoked in criminal law trails, herself worshiped by magistrates and clerks throughout the realm, but with considerable overlap in civil and criminal law both gods are often called upon to bless and guide all those involved in legal matters. Most of the other lawful gods of the Old World pantheon are worshiped somewhere in Tilea, having shrines and chapels, guardians and priests. These ‘lesser’ faith priests and priestesses are often called brothers or sisters rather than fathers or mothers. Manaan, Shallya, Taal and Verena are the most prominent churches outside of the Three. Shallyan sisters have hospitals in every city and major town, as well as country hospitals for those in need of isolation. It is widely believed that secret shrines to the trickster Ranald are hidden away in the slums of all the biggest settlements, and although his more devout followers are distrusted and unwelcomed by most people, they have never yet been put under edict of excommunication. Followers of Khaine the Murderer, or the vile gods of Chaos, as well as all the known wicked gods, are all by law subject to excommunication, making it every lawful Tilean’s duty to thwart, arrest and if necessary, kill them. Petty shrines to foreign deities, like Ulric and Sigmar are tolerated in the cities and ports commonly frequented by foreigners. As a final note, I must mention a trend in evidence in our realm of Tilea, which is novel and philosophic in nature, however foolish and false, and is of a kind not commonly found elsewhere in the realms of men. Perhaps it is an inevitable error, considering the frantic swirl of ideas and invention encouraged in Tilea? Artists conjure illusions and masterpieces worthy of wizards or priests, while architects are guided by mathematical principles to create buildings to rival those made by elves or dwarfs. Such are the successes of these endeavours that misguided men begin to wonder whether their own marvellous works might equal those of the gods. I have myself heard, upon several occasions, scholars discussing deities as if they were metaphors rather than reality, as if they were merely the stuff of myth, superstition or literature. Some consider magic not to be the work of gods, but instead a mysterious, dangerous, yet entirely natural phenomenon, caused perhaps by sympathetic resonances arising from men’s wills and alchemical admixtures of potent ingredients, or perhaps arising from etheric currents flowing both above and below ground like air and water might do, or even as the manifestations of a neighbouring yet quite alien plane of reality. (All this despite the obviously potent blessings the wisest priests can channel through prayer.) Many such people would rather recognise ‘Fortuna’ as their only goddess, not in the form of a heavenly, immortal being, but rather as an all-pervading force, the spun web upon which all our lives are caught. I would not wish to labour this point overmuch, however, for such irreligious men are thankfully few in number, their misguided beliefs cannot prosper, and they themselves will surely dwindle to nought in time. As evening fell, all was quiet in the peaceful hamlet of Farina. Simply a cluster of houses, little bigger than an inn, it lay two miles north-east of the town of Astiano. Its inhabitants had had their fair share of troubles of late, what with the Duke Guidobaldo of Pavona’s recent conquest of Astiano, and the inevitable looting and protection payment demands by scavenging bands of soldiers. Now they had learned that the infamous Compagnia del Sole, reputedly the largest condottieri force currently active in Tilea, were outside the walls of Astiano. Happily, the mercenaries seemed keener to extract money from the town’s citizens than to scour the land around. If the council of Astiano chose to pay promptly, it was perhaps possible that Farina would this time remain relatively undisturbed. The Astianans were indeed willing to raise the necessary bribe quickly, but their new lord, Duke Guidobaldo was moving even more quickly. He had been riding at the head of his state’s army trying to catch the Compagnia del Sole before they could do too much of what mercenaries were famous for doing – looting and burning. He had already failed to prevent their destructive raid on his newly completed settlement of Venafro, which sat astride the road joining his old realm with his new possession, and had no intention of allowing the robbers to rob even more from Astiano. Upon the approach of an outnumbering foe, any other mercenary company wouls most likely have fled away. General Micheletto Fortebraccio and his officers had no intention of doing so, however, for their baggage train, filled with the goods stolen from Venafro, was not exactly capable of speedy movement. Every officer agreed that the loot took precedence, and the fact they were on the verge of being made even richer by the terrified populace of Astiano simply increased their greed. When the Compagnia’s council of war considered the matter of their reputation, they were not worried over what would become of it should they turn tail and flee, but rather encouraged by the fact that it was surely good enough to make the Pavonans think twice before committing to battle. Had not the Duke of Pavona spent the last six weeks hesitantly probing and manoeuvring in an effort to scare them away without actually having to meet them in the field? So it was that the Compagnia, sensibly concentrated in one camp for just such a situation, marched boldly towards the advancing Pavonans. They would not wait to fight defensively with Astiano to their rear, but chose to attack, and in so doing hopefully fuel the enemy’s doubts the enemy concerning battle. The people of Farina ran from their houses, taking only what precious belongings they could easily carry, and as the sky darkened, the abandoned settlement grew very quiet indeed. Then, from both east and west simultaneously, came sounds – drums, horns, shouting. 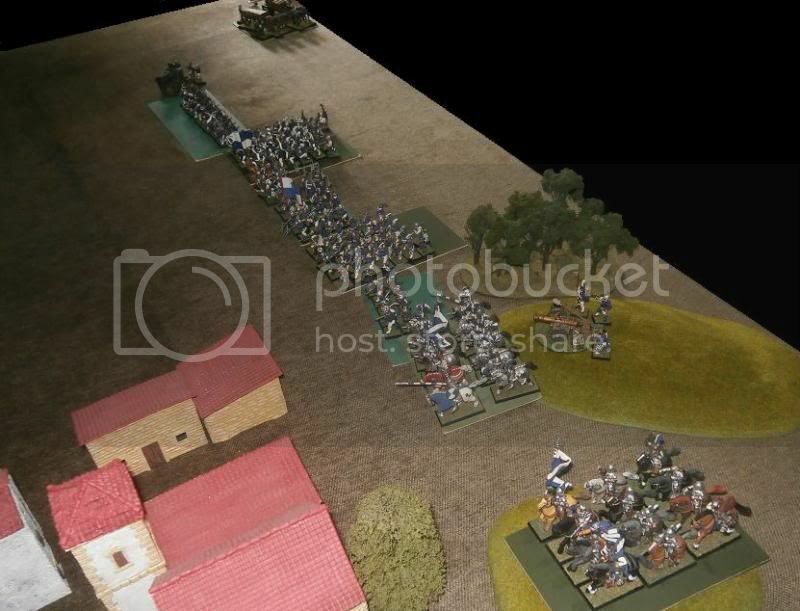 The two armies approached, and both were already arraying from line of march to line of battle. Captain Brizzio Scarpa led the Compagnia’s mounted men at arms on the far right flank, advancing over the low hill towards Farina. Every man wore full plate armour and rode a barded horse, and all but Scarpa carried a yellow and white striped lance, lending the regiment a most pretty appearance. Upon the other side of Farina, on the flatter, less woody ground, came the Compagnia’s main strength. The gunners hauled the two artillery pieces onto the last of the little hills, while below them the foot-slogging men at arms and the large regiment of halberdiers marched in line and in step. Out on the far left flank a large company of crossbowmen rushed forwards to plant their protective pavises and begin the skilled business of spanning their crossbows. The Pavonans came on in a not dissimilar array. 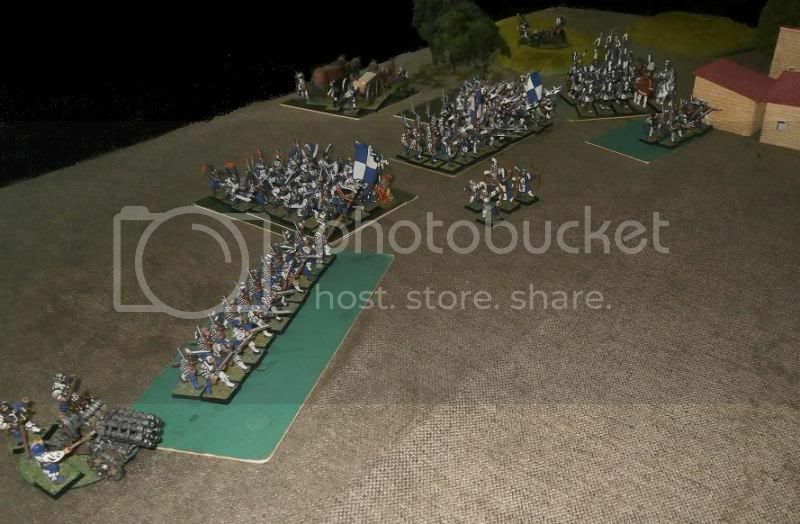 Mirroring the mecenaries, they planting one of their own artillery pieces on a hill, while their horse soldiers were arrayed on their left and a large body of handgunners on the right, with their massed foot regiments in the centre. Their line, however, overlapped the Compagnia’s for they had two large bodies of mounted soldiers, not two but four regiments of foot, and three of those with detachments. They were also equipped in a most modern manner, for on their far right they placed a helblaster, a novelty acquired by the duke from Nuln. … although this did mean they would face a much larger body of pistoliers who were already trotting boldly forwards past the little hamlet. General Micheletto Fortebraccio surveyed the enemy, noting their numbers, their arms, their disposition. Their blue and white banners fluttered prettily above the glittering steel of their helms and halberds. One thing that caught his eye immediately was their uniformity – not just in their livery, but also the steady ease of their advance, the neatness of their ranks and files. This was certainly no hurriedly mustered force of ill-trained militia, but an army both practised in drill and sure of their cause. Perhaps it was not only their leader Duke Guidobaldo who thought himself favoured of Morr? Could it be that the soldiers were also emboldened by religious fervour? What happened next was not what the general expected. 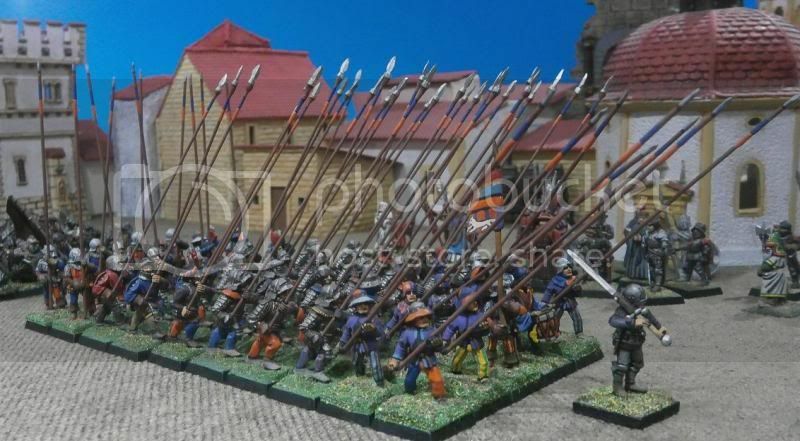 Rather than advance in line to bring all their strength to bear as one, the Pavonan line broke up as their handgunners and archers moved ahead while the main fighting units remained where they were. 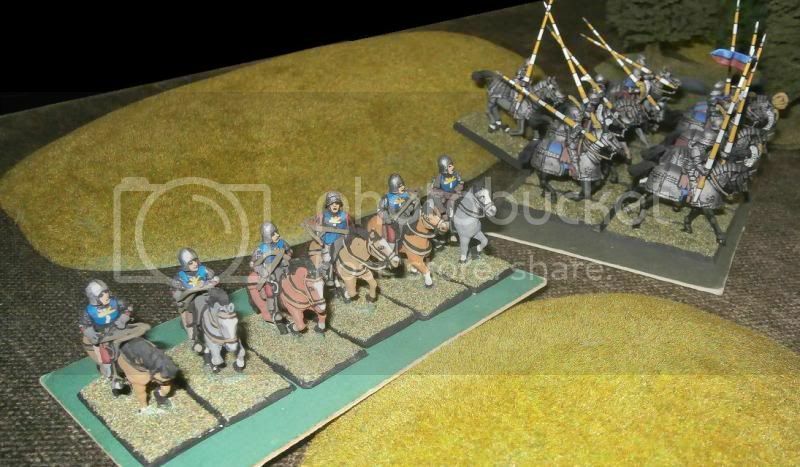 In doing so, they even blocked their heavy horse’s line of advance! Maybe, he thought, the foe was not so confident after all? Maybe they thought to fight this battle at a safe distance, afraid to engage in the melee? Or maybe they knew something he didn’t know? 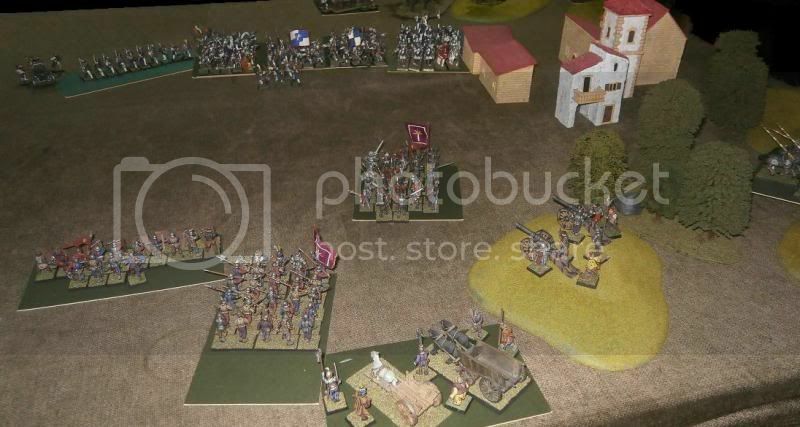 It now dawned on him that the enemy might have more units moving up on the Compagnia’s right flank, obscured by the hamlet. If so, then he hoped Captain Scarpa could deal with it, or at the least find a way to warn him about it. What he could not know was exactly what the enemy had upon that flank. Oooh! Tilean vs. Tilean! A battle is about to be joined! And where'd those buildings come from? Yeah GP, Tileans all round. One side purely mercenaries, the other more Empire like (i.e. one using a modified T&G/EoW list, the other a standard Empire list. Neither being anything akin to a power list - both very fluffy and WYSIWYG. 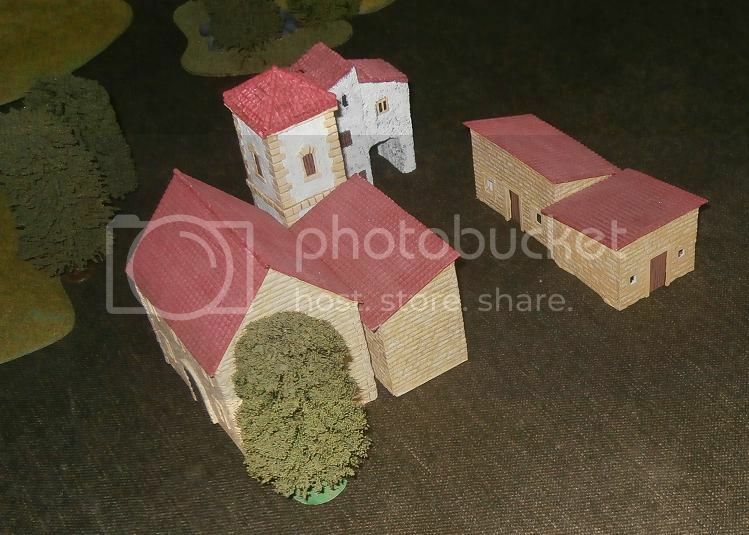 The buildings - some are bought, most are made from foam card, balsa, modelling clay and roof-tile sections. A dozen Pavonan pistoleers advanced confidently over the hilly ground to the west of the hamlet. Each was furnished with at least a brace of pistols, and all enclosed in well-fitted armour. Several sported blue and white plumes upon their helmets. Their mastery of horsemanship was very obvious as they came on in close order even over the rough ground. 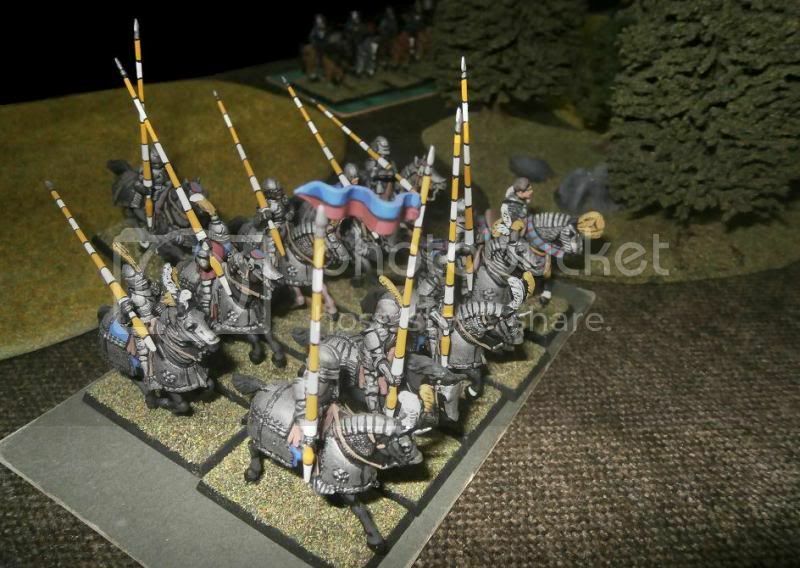 Captain Brizzio Scarpa, commanding the Compagnia’s heavy horse quickly realised he could not simply choose to ignore them and continue his attempt to flank the enemy’s main line just as the battle was joined. 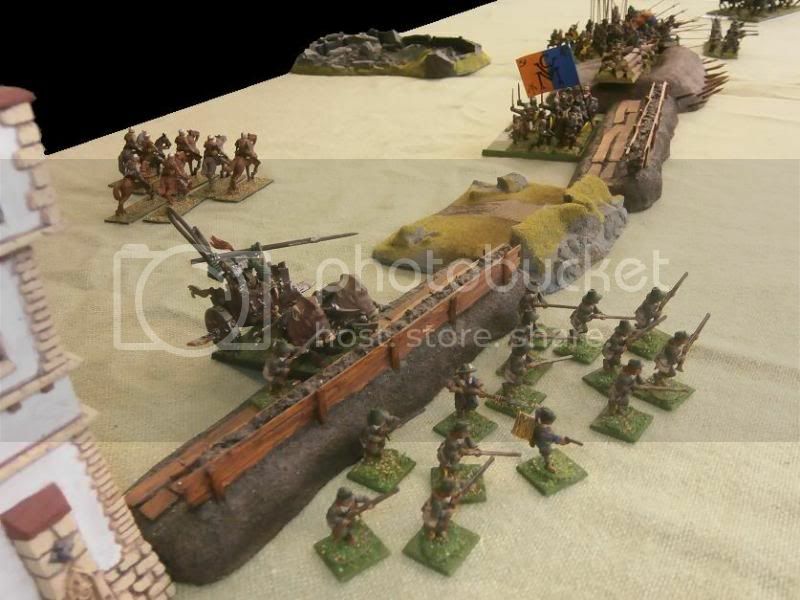 To do so would most certainly leave these pistoliers free to wreak havoc at the rear of the Compagnia’s line – perhaps killing the artillery crews on the hill, or even capturing the precious baggage train. Thus it was that – reluctantly - he gave the order for his regiment to turn and face the foe. His heart sank as he did so, for he knew full well how difficult it could be for a body of heavily armoured riders such as his own to get to grips such a slippery opponent. Light horsemen could often perform a nimble dance when they had to. 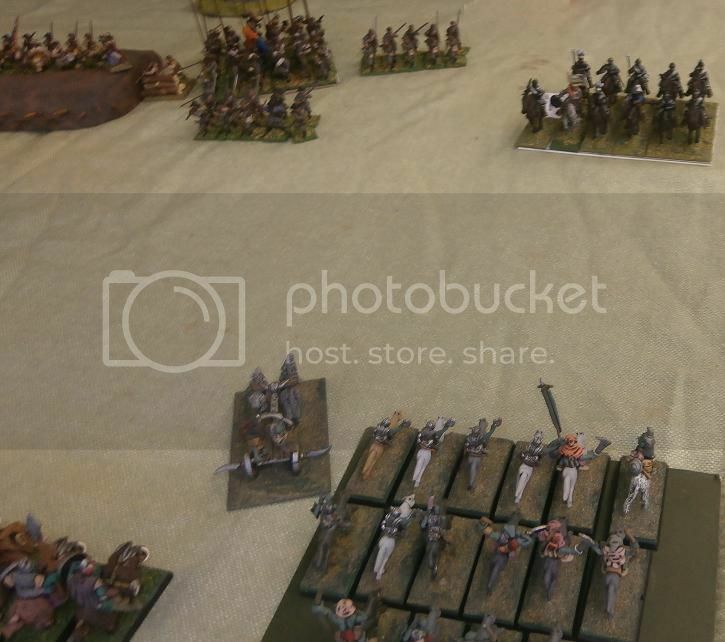 As his men turned, the enemy unleashed a loud volley of pistol shot at the Compagnia’s mounted crossbowmen (Game note: 24 shots!) Unsurprisingly several of the Compagnia soldiers fell as a consequence, leaving only one pair alive. These remained before the foe, (Game Note: I got lucky with the panic test!) stunned and not exactly sure what to do. What Scarpa had not noticed was the enemy cannon upon the hill on the other side of the hamlet. 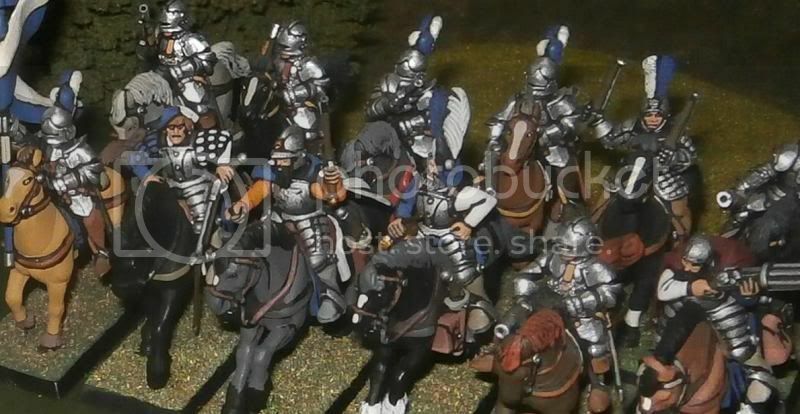 The men crewing that cannon had, however, spotted the sunlight glinting off the horse’s steel carapace as the mounted men at arms turned into position. The gunners grinned as they hefted the piece around to aim its muzzle through the gap between the tower and its neighbour right at the horsemen’s rear rank. The ball whizzed by the buildings to decapitate two of the riders, much to the confusion of their comrades, who heard the awful ‘thud, thud’ before the distant blast of the cannon. 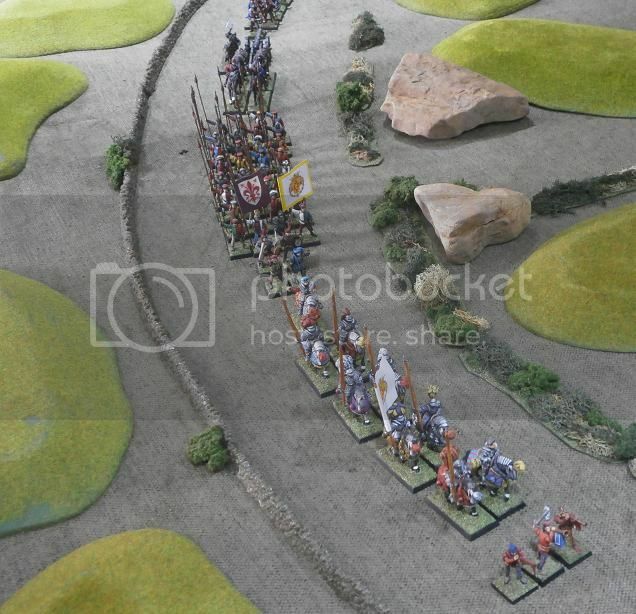 No doubt keen to vacate their current position, they spurred their horses on to attack the rear of the pistoliers who had just cut down the last two crossbowmen. When they realised heavy horse were about to close on them, the Pavonan pistoliers’ bravery dissipated and they fled away pell-mell not to return to the battle. (Game Note: A chancy flee roll took them too far and thus off the table.) The mercenary men at arms let loose a huzzah and, under Captain Scarpa’s orders, began the business of reforming so that they could go about their original intentions. Captain Scarpa prayed that they were not too late. The Compagnia del Sole’s maroon flags fluttered in the blustery wind as their two main bodies of foot soldiers awaited orders. General Fortebraccio was growing worried. Captain Scarpa and the horse should have made their appearance by now, and yet there was no sight of them. A little while ago he had heard the sound of a volley of firearms, perhaps pistols, perhaps handguns – he could not be sure. Since then, nothing. If his own horse did not come around the flank it would leave his two regiments facing three enemy regiments of foot and their horse. The enemy line would extend far beyond his own, allowing them to overlap, flank and so engulf the Compagnia foot. Fine soldiers as General Fortebraccio’s men were, it was not likely they would stand their ground if attacked on both sides while pressed to the front. Not a man to delay when events needed a decision, the general glanced over at Captain Gaetano over on the front and left of the foot men at arms to his right. Gaetano’s white hair was blowing wildly, while his heavy blade was held before him, shining sharply. General Fortebraccio knew the old soldier would follow his command without question, and already – even before he had fully realised what he was going to do – a pang of guilt played through him. He was damned if he was going to lose the loot they had already taken, and doubly damned if he would risk the Compagnia’s annihilation to boot. It was time to leave, taking the loot with them. Not soon, but right now, while the men at arms where able to hinder the enemy’s inevitable pursuit. The guilt he had felt before now surged - not because he was going to ask Gaetano to fight, nor even because it was a fight the captain would surely lose, but rather because he would have to lie to his old companion, and cruelly too. As he could hardly make it appear he was sending Gaetano and the men at arms to their death simply so that he could abandon them and save his own skin, he would thus have to order the advance in such a way that Gaetano and his men did not realise what was truly intended. It was a lie only by omission, but that did not make the general feel any better. So, having commanded the drummer by his side, the beat went up for a ‘right-hand advance-oblique’, a manuoevre the Compagnia had practised on several occasions: the right-most unit would march on, the next waiting a moment before doing so, resulting in their staggered arrival at the foe’s line of battle, hopefully allowing the second and subsequent units time to respond to whatever the enemy did and thus better protect the flank of the first unit. 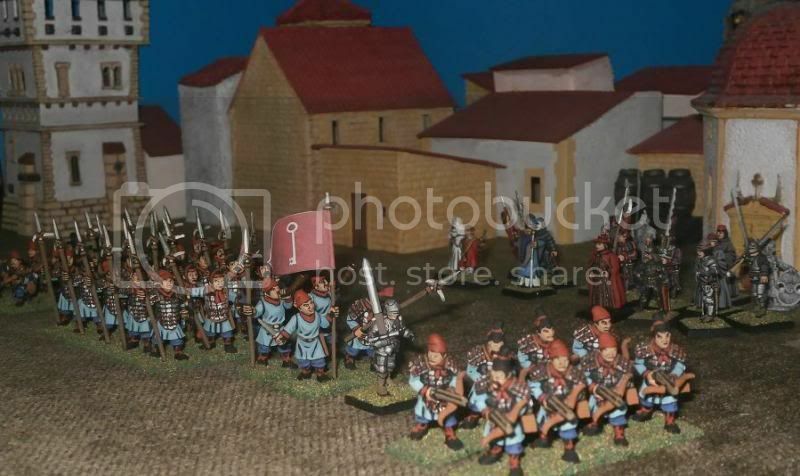 Except that after the order was given and the men at arms moved on, General Fortebraccio held up his hand to signal his own regiment to stay put. And so they stood, watching the other regiment march out alone. 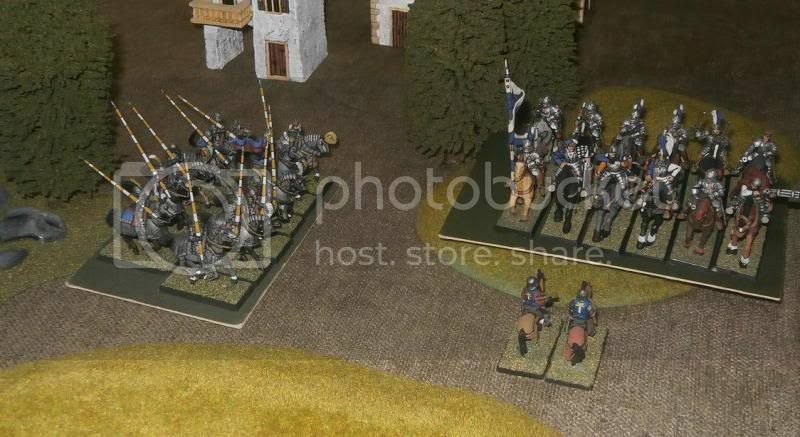 Having already lost five men to the enemy’s magic and seven more to a well placed cannon ball, the halberdiers were sufficiently stunned enough not to question the order. Banhaltte the ensign frowned, then revealed his confusion to General Fortebraccio with a gesture. “We’re not advancing?” he asked. The general simply stood silently, watching, his hand still held aloft. His guilt was welling to unbearable levels, mixing with anxiety and regret. All his men were hardened mercenaries - his men at arms skilled warriors clad in plate steel, his halberdiers emboldened in any fight by the magical aura of their blessed banner. He looked again at the foe. Yes, they had the more bodies of men, but those bodies were smaller than his, even after all the damage his halberdiers had received, and they were not so well armoured. Nevertheless, he found himself signalling to his halberdiers to fall back facing the foe. As the drum beat the command, he could just hear Banhaltte words, this time said with bitterness: “We’re not advancing.” Then the general spotted something between the trees and the hamlet, something coloured yellow and white. 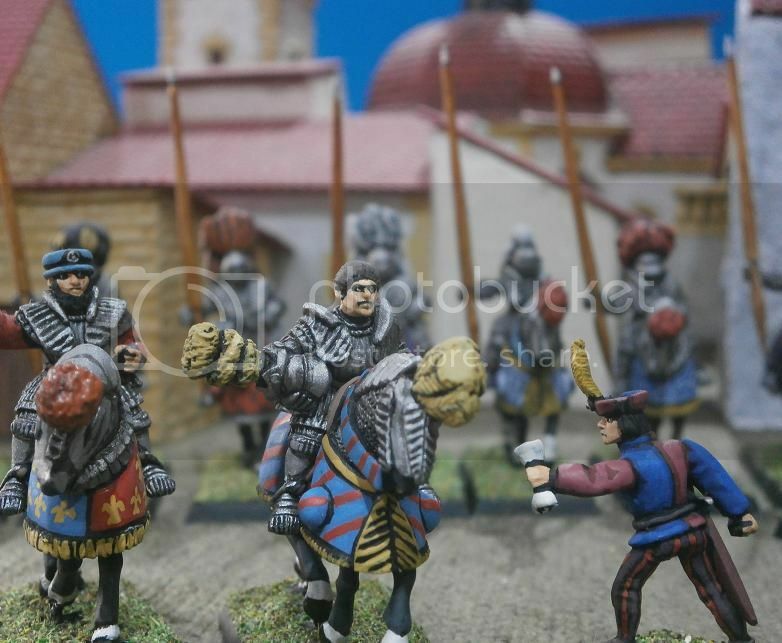 Captain Gaetano and his men at arms had apparently not noticed the general’s deception, for they marched boldly onwards – some even let out a cheer when they spotted their own heavy horsemen off on the flank. Captain Scarpa halted the horsemen and watched as the men at arms were charged. The foot soldiers received the charge defiantly, barely budging an inch, and after taking some casualties from the foes’ first thrusts, brought down their heavy blades, pole-arms and hammers to take down some of the foe. Scarpa knew this should have been the moment he and his company joined the fray, but he knew also that something was wrong. Where were the others? Had the enemy somehow broken the general’s large regiment of Halberdiers with magic and missiles? 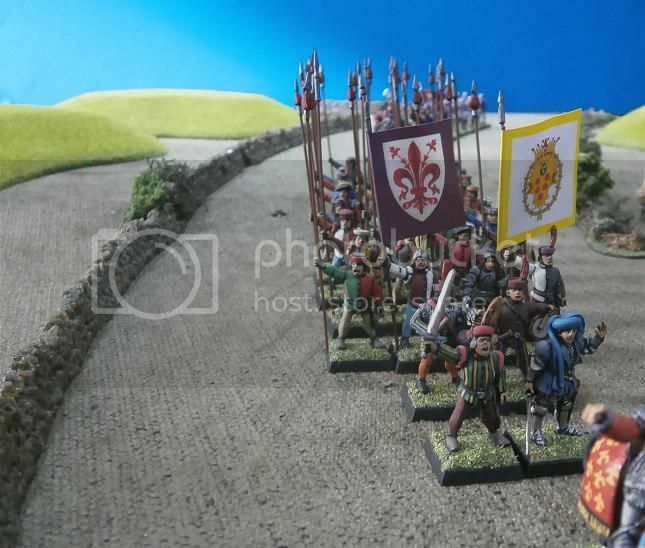 When he looked across the field, however, he saw the General Fortebraccio and most of the halberdiers were still present, just not where they should be. Worse than that, they were – albeit steadily - falling back. Then, just as the melee in the centre of the field became a furious, clattering mess of screams and blood, the halberdiers turned and began marching away. The battle was lost. Captain Scarpa now realised that Fortebraccio must have already decided it was lost some time ago, and was in the process of ensuring that neither the Compagnia nor the loot was also lost. So it was that he too ordered a withdrawal, leading his horsemen away just before the foot-soldiers in the centre were finally broken and the foe spilled over them and onwards in the grip of battle lust. 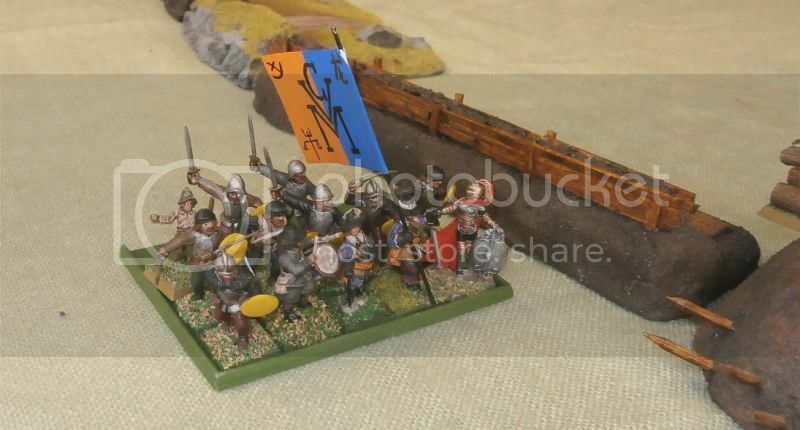 A handful of crossbowmen, and the surviving knights and halberdiers now moved hastily away, not quite disorderly, urging the baggage train on as best they could. It was not the Compagnia del Sole’s finest moment. 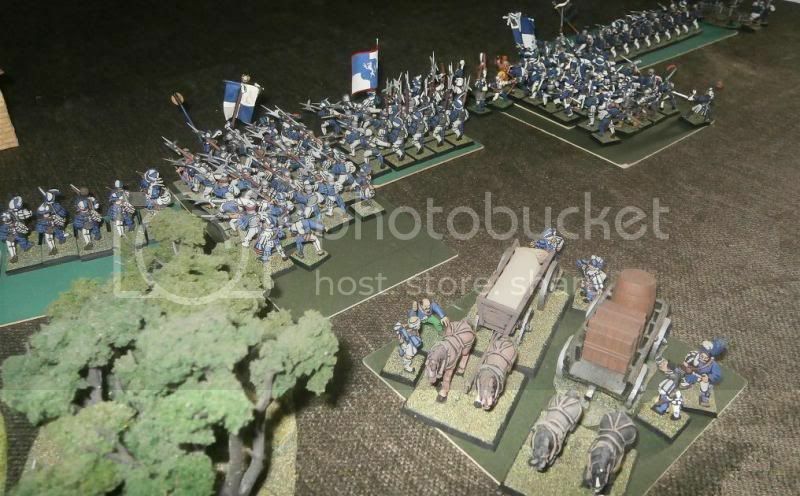 Game Note #1: At the point I made this decision I did not realise that the heavy horse where going to successfully drive off the Pavonan pistoliers, and also have time to get up to where I originally wanted them. So, being the campaign GM, commanding an NPC mercenary force, I rolled a dice to decide if the Compagnia might take the campaign-rules option of a fighting withdrawal from the field. For this to work, one has to have a unit of suitable strength fight for more than one round against the enemy. 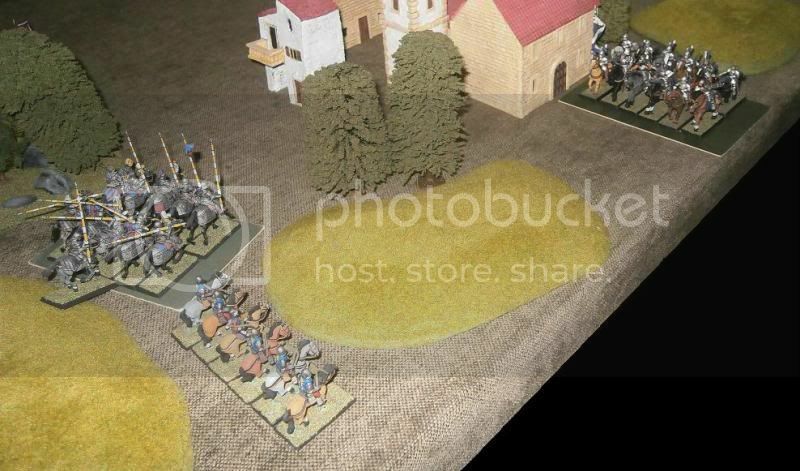 If so, this counts as a ‘holding action’ and allows the player to retreat units off their own table edge to begin flight from the battlefield. It’s a risky manoeuvre, involving rolling on various campaign-rules’ charts, but it seemed my only option in light of what I thought was almost certain defeat otherwise. I wish I had noticed the horse, however, because with them coming around to support the flank, I probably had a good chance of victory! Game Note #2: I felt stupid at this point, blaming my tactical rubbishness on the fact that I was taking photos and making notes and such. 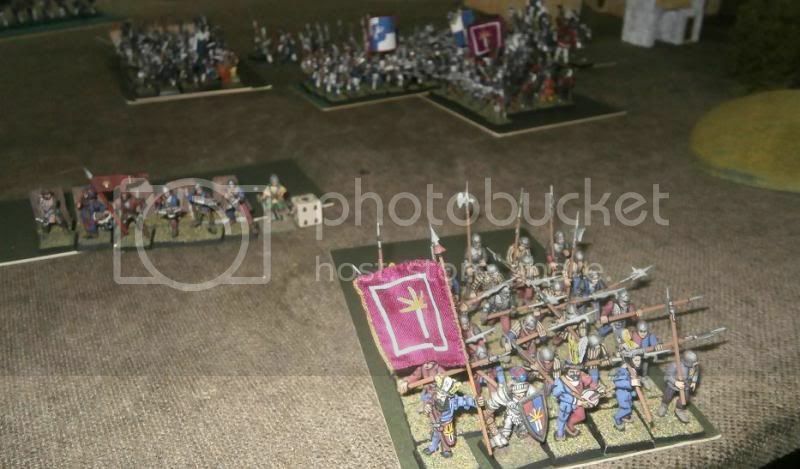 If only the halberdiers were at the men at arms’ side! 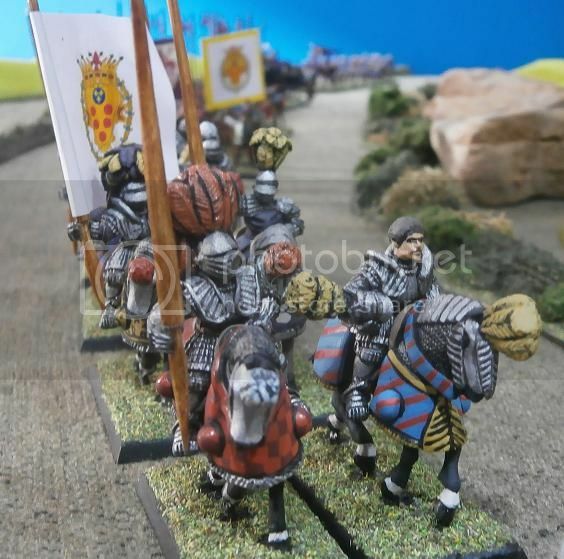 I consoled myself with the fact that the enemy knights had not one but two well equipped lords in their body (Duke Guidobaldo and Lord Polcario), so probably would have ‘gubbed’ my boys. But in truth I knew I had turned an exciting drama full of possibility into a desperate sort of drama, full of running away! It had been a long afternoon. The leaders of the exiled Pavonan Dwarfs had been discussing their future, working their way through every place they might make their new home; one by one dismissing them. Now, as the sky darkened on this late Autumn day, they addressed yet another possibility - Remas. 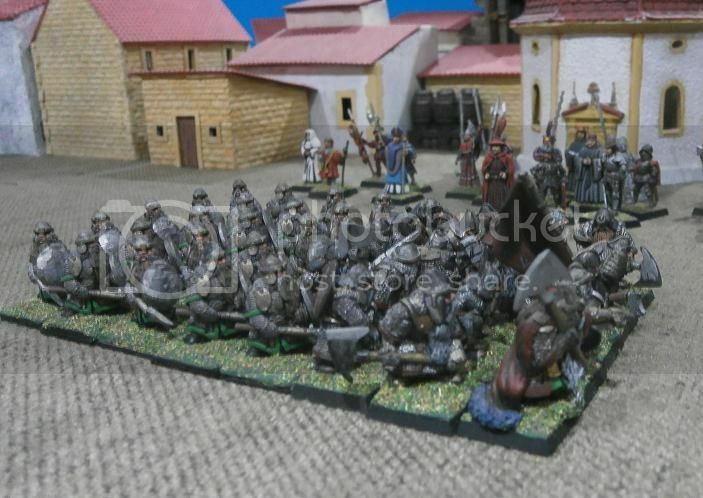 The assembled dwarfs became agitated. Confusion was mixed with disbelief, contrariness with doubt, and the questions came tumbling out: Was Norgrug certain? Why did no one else know this? How did it come about? The company fell quiet, Boldshin included. It was the eccentric – How can a dwarf wizard be described as anything but eccentric? - Master Glammerscale who broke the silence. Arch Lector of the Tilean Church of Morr, His Magnificent Holiness Calictus II, was not the only high cleric to attend the blessing. 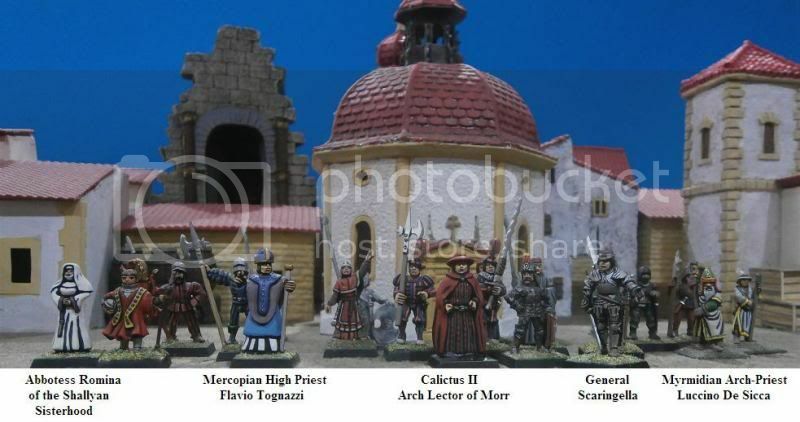 As his command of the Reman army had been confirmed by the Triumverate churches and the edict sealed with ‘MMM’, then the Mercopian High Priest and Myrmidian Arch-Priest were also present. The three church rulers, with the attendants and guards, as well as several clergy from the minor churches, stood before the oldest Morrite church in the city, that of Saint Ettore of the Flayed Arm. Calictus II wore a cloak of vermillion, the traditional peaked hat of a lector, and a red and grey striped cassock bedecked with solid gold roundels. His two bodyguards, both northerners sworn to lifelong service, were liveried in the orange, blue and red of Remas, while his captain of the guard, the moustachioed Kislevite Lukyan Soldatovya, wore full plate armour. Flavio Tognazzi, High Priest of the Church of Mercopio, carried a shoulder height staff of bullion silver, topped with a golden knob. His gold-rimmed mitre added a foot to his height and his heavy, multi-layered vestments - cassock, camisia, surplice and stole. He held his right hand aloft to deliver his blessing as the soldiers marched by, his own flamboyantly slashed and puffed bodyguard standing boldly behind him. The Myrmidian Arch-Priest Luccino De Sicca was attended by a novice priestess and two mercenary guards. He wore a heavy hood, gauntlets of thick leather, a robe trimmed in yellow and green and carried a staff fashioned from the preserved remains of the spear used by the hero Publius Cornelius to kill a three headed dragon during the time of the ancient Reman Empire – a staff now tipped with a golden reliquary containing the ashes of said Publius Cornelius (who, of course, perished in the fire gushing from all of three mouths even as his magical spear pierced the triple-headed beast’s single heart). 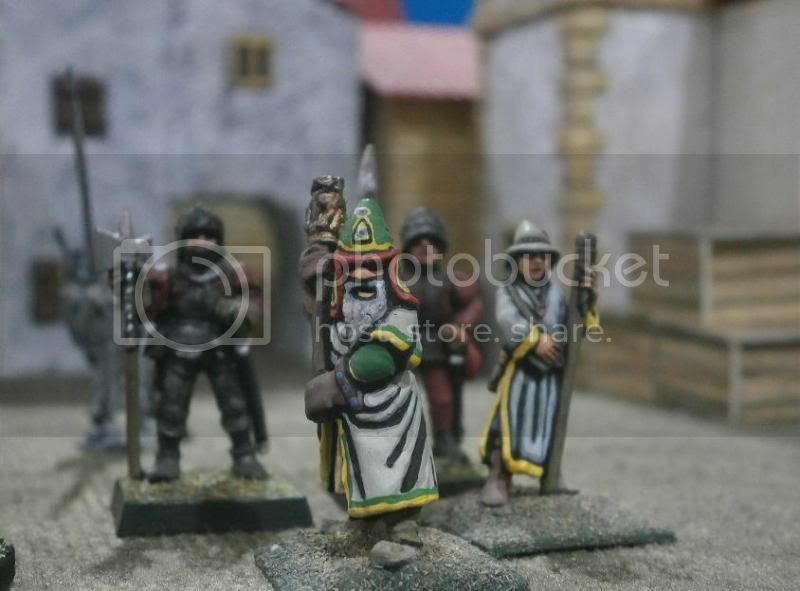 The first soldiers to pass the little crowd of high clergy and attendants were the dwarfs, a solid mass of iron and steel, wearing armour over armour. Their presence in the Reman army, acting as the General’s Lifeguard, deployed in the most privileged position on the right of the army’s vanguard, and always first in the column of march, they were certain proof that the Remans were not of a like mind with the duke of Pavona. Next in line was the Cathayan Company, the foreign sound of its brass horns no longer a strange one in the city. The soldiers bore an ensign bearing an old emblem of Morr, the key to the afterlife, and beneath their scale armour wore the blues and reds of Remas. Their main fighting body, armed with a far eastern style of spear that could double as a halberd, was preceded and followed by crossbow companies. 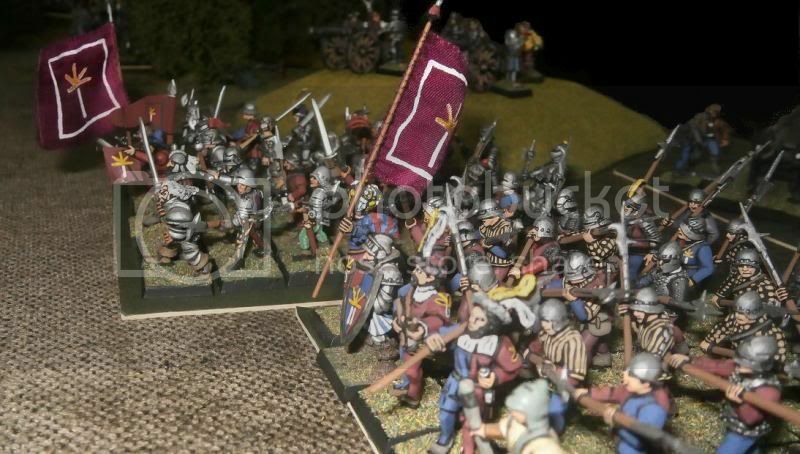 The Cathayans were followed by the mercenary pikemen, a regiment of fifty northerners, nearly all from the most northern regions of the Empire. Their pikes, held at high-port like a forest of young trees bending in a gale - had been decorated with the city’s colours, while they themselves wore the same colours in and amongst their own attire. They were led by their swaggering major, who had a huge, two handed sword sloped upon his shoulder. Biagino found it difficult to keep up with Ugo. Not that Ugo, a coachman by profession, clad in a long, thick leather coat over a mail shirt and carrying the heaviest looking firearm Biagino had ever seen, was particularly fleet of foot, rather that he was less wary about making a noise. Biagino hated being so close to someone who seemed wholly intent on advertising their presence to all and sundry. This was most definitely neither the time nor the place to be so loud. Three times Biagino had pleaded with his companion to be quiet, only to be answered by an instruction to hurry up. While Ugo wanted speed, the priest wanted quiet. They were in agreement about one thing, however, neither wanted to be there at all. They had been sent to the woods north-east of Busalla, close to where the road branched to Viadaza, due to reports of enemy movement thereabouts. Up until now the Viadazan undead had stayed within the city bounds. If they were moving further a-field then it could prove a very dangerous hindrance to the activities of the last remnants of the Morrite crusader’s army. Right now, Biagino was acutely aware that the enemy could prove very dangerous to him personally any moment. While there was concealment for him and Ugo in the many shadows, there was also concealment for anyone or anything else. For all he knew these woods could be bursting with night terrors and grave-horrors, and a monstrous fiend waited behind the very next tree. Perhaps only dumb luck had kept them alive so far? It did not help that every second tree adopted the guise of some ghoulish creature, the branches so easily transforming into ragged limbs reaching out to claw at him. At long last and quite suddenly, Ugo began to move cautiously, bringing his boots down softly and carefully. Stifling the urge to vent his annoyance by pointing out that Ugo had obviously been capable of silent movement all along, Biagino instead chose to give thanks to Morr that his companion had finally seen sense. The feeling of satisfaction was short lived, however, as it now occurred to him that there must be some pressing reason for the coachman’s sudden caution. One look at Ugo’s wide eyed face confirmed this suspicion. “What is it?” Biagino whispered. Ugo put his finger to his lips. It was an action which in light of his previous carelessness would have much exasperated Biagino if it were not for the manifestation of a fear so strong as to override all other emotions. Ugo removed his finger, and very slowly – as if to move his arm suddenly would in itself be dangerous - reached out to point through the trees. Once Biagino turned to look, Ugo hefted his dwarf-made, iron and steel monstrosity of a blunderbuss, and peered, wide-eyed, through the trees himself. Biagino was not going to argue. One look and he could see they had almost stepped into a nightmare. He was no innocent. He had faced the undead in battle. But then he had an army about him, strong in their beliefs and firm in their ranks and files. Now there was only him and Ugo, alone in the woods, and mere yards from a veritable legion of undead. “Reports of enemy movement,” General D’Alessio had said. At any other time the pathetic insufficiency of that comment might have brought a wry smile to Biagino’s face, but here and now, faced with the truth, it was a sob he had to stifle. 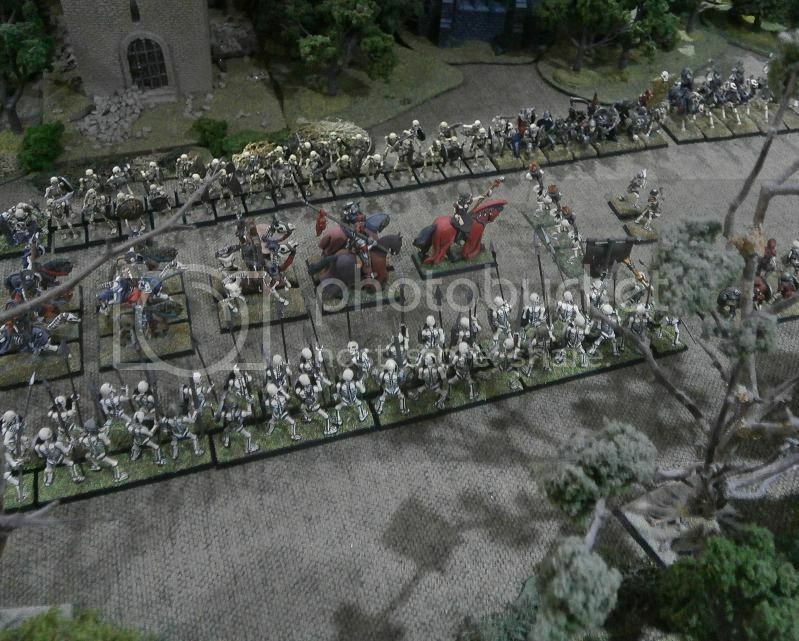 Skeletal warriors lined both sides of the road, two ranks deep, their bones clean and white –thoroughly washed by the rains of earlier that evening. They clutched spears, and but for an eerie twitch here and an uncanny twist there, they could have been mere statues. The only sound was a strange creaking and scraping, emanating from bones grinding in sockets and ossified spear-shafts rubbing against the rusted rims of ancient shields. Then there was another sound: the slow beat of drums, of the kind that might go before a convicted felon being led to the scaffold. Neither Ugo nor Biagino could bring themselves to move, such was the new layer of trepidation conjured by that sound. Biagino wondered if they were about to witness some poor souls being led to their doom, their blood to be drained by vampires or their bodies twisted and corrupted by necromantic magic. Yet he knew that was not likely. 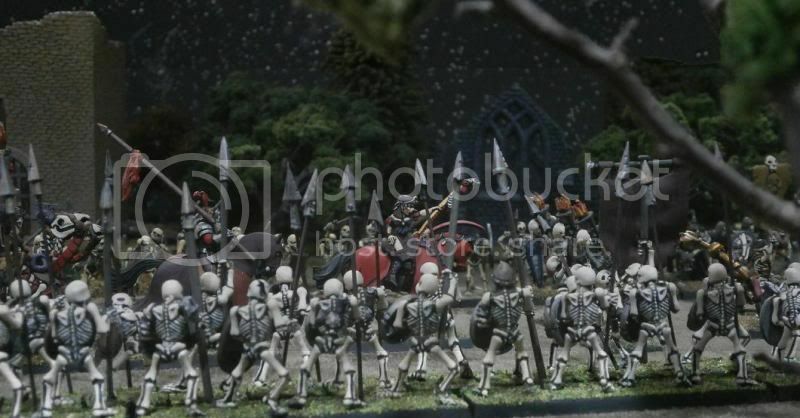 The undead were arrayed as if to welcome a prince, to show their strength and be inspected at one and the same time. This was more like a parade. Indeed, moments later, a pair of drummers marched by, then three torch bearers, followed by some nobly attired riders. The first of these was a lady riding side-saddle upon a mount barded in flowing, blood red silks. Her skin was deathly pale, and she wore a headdress and diadem of an archaic style. In her right hand she wielded a brazen staff topped by a silvered serpent’s head. She was a vampire. Her appearance was proof enough, but the potent aura she exuded confirmed washed away all hopes that she might be anything else. Biagino had felt the same deathly chill before, on the field of battle at Pontremola, where no less than two such fiends had commanded the enemy host. At that moment, the vampiress turned her head slightly, in Biagino’s direction. His insides churned as dizzy fear washed through him. Then he saw that she was not looking at him, rather at something that had caught her eye amongst the skeletal warriors lining her route. She turned back. Just as it seemed impossible to be more afraid, he was: he realised he knew her face. He had seen it before in his nightmares. More than that, he had met her in waking life. Since then her flesh had blanched, her mouth become distorted by the fangs curling from her upper lip, and her cheeks had sunken so that bony ridges now framed her huge, dark eyes. But her expression was one he had witnessed before, for she had used it upon him. She wore only a hint of it in life, but in his dreams she had given that same scornful, wicked and proud look full vent. It was the Duchess Maria! His knees weakened, threatening to bring him down. He stumbled backwards a little way. Luckily, the rustling sound thus made was hidden by the sound of drums, hooves and clattering armour from the road. Even Ugo failed to notice. The Duchess Maria had been corrupted. She had turned, then returned. And here she was being welcomed by an army of undead into Viadaza. 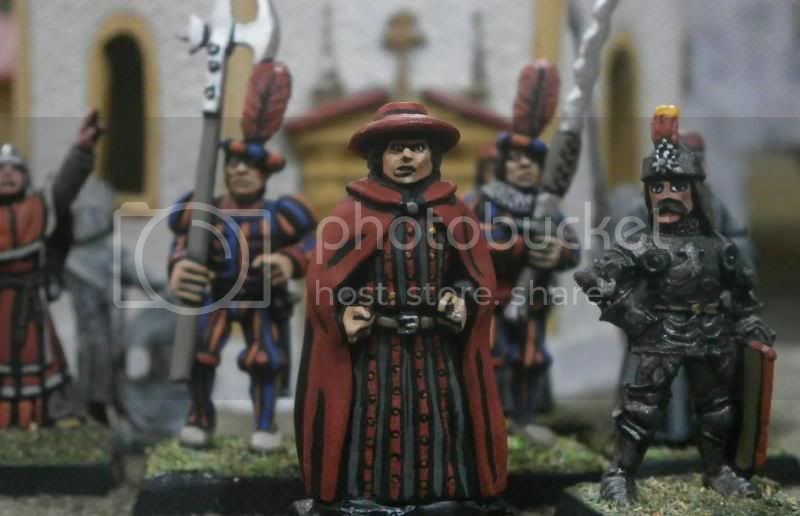 Unexpectedly, he knew immediately it all made sense: the Duchess’s miraculous escape from Ebino; her lack of effort in convincing Lord Adolfo to support the crusade; Lord Adolfo’s uncharacteristic, dreamy fascination in her, and the way Viadaza fell to the undead almost immediately the Morrite clergy had left. All these things fitted together. The duchess never did escape, but had become a secret servant of evil, no doubt sent to sew the seeds of Viadaza’s destruction. She beguiled Lord Adolfo to fatally weaken the crusade, whilst simultaneously ensuring the priests of Morr still left the city. The fall of Viadaza was her doing. His nightmares had been a sign all along. Morr himself had no doubt sent them to reveal the truth, yet Biagino in his ignorance – so many times - had woken, drenched in sweat, simply to dismiss the lingering images from his mind as quickly as possible. He thought them a weakness arising from his own self-doubts, when they had been no less than an inspired vision of the truth, presented starkly and boldly. Here was the duchess exactly as she had been in his dreams, the true self she hid behind her sorcerous disguise. The Vampire Duke Allessandro Sforta was no more. Now there was the Vampire Duchess Maria Colleoni. The curse upon Tilea had not been diminished at all. If anything, it was waxing stronger, threatening to conquer more cities and towns and to swallow ever more souls. It's nothing, sir. Just a burn from a ray gun. Another great post by the master! That's the old DoW Belladonna Whatevertheycallher, right? The figure is the old mounted Liamhian vampire. good work as every padre. Thanks Damian. And yeah, an old Lahmian figure is right I think. Can't for the life of me recall how I got her. I know I painted her for an old campaign for the next door neighbour's wife's character. Yeah, we had nearly the whole street involved. Shame you can't be there for the battle tomorrow. I have a feeling that Khurnag's Waagh might have done better under your command than mine. But still, I'm gonna go green on Uryens. 3300 points of green. If only his army hadn't been busy digging defences, then it would be easy. The mercenary army of the Vereenigde Marienburg Compagnie’s Tilean enterprise had been busy. Their establishment at Alcente had been granted in return for providing much needed defence against the Badlands’ orc warlord Khurnag. Now they had to make good that promise, for Khurnag had turned his attentions towards the south-west and was approaching the watchtower at Tursi with a large Waagh!, perhaps his entire strength. So it was that the VMC soldiers had incorporated the watchtower into the defensive perimeter of a fortified camp. The construction was not fully complete, but it was substantial, as they had piled earth up to create parapeted works and palisaded bastions. Here you can see the eastern portion of those defences, where the tower itself stood. The tumbledown ruins of an ancient shrine to forgotten gods formed one side of the eastern gate, while an earthen bastion bristling with sharpened poles sat upon the other. The tower itself was typical of the southern region of Tilea, constructed of local stone (unlike the ancient ruin), plastered and painted, with tiles of red clay atop its buttresses and crenellations. The watchtower’s recently installed garrison, a company of mounted handgunners who had been assigned the duty of regular patrols throughout the area south of Sussurio and north of Alcente, now formed part of the army awaiting the Waagh. Initially they made as if to attempt to outflank the foe, ensuring they were spotted as they feigned doing so, but then they doubled back and settled themselves behind the wooden defences to the south of the tower. 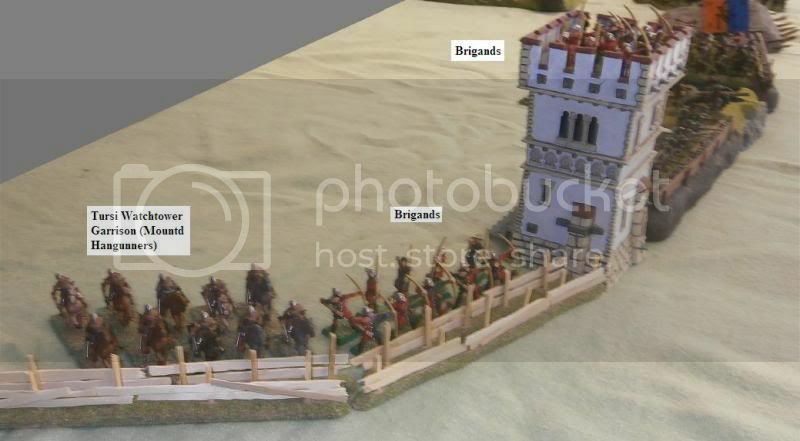 Two companies of locally raised brigands defended the same stretch of defences, one being behind the double fence (yet to be filled in with earth and stones), the other occupying the tower itself. The VMC’s main strength was deployed along the defences on the other side of the tower. A twenty strong firelock company, until recently employed separately to the rest of the army, manned the first stretch of earthwork. They were clothed in grey and armed with long barrelled but light pieces of a novel new northern design inspired by dwarfen lock mechanisms, which did not require slow-match for ignition. Well drilled and already experienced in battle, they now flashed their pans, adjusted flints and frizzens, then stuffed lead balls into their cheeks ready to spit into the muzzles after loading each charge of powder. A brass-barrelled saker was emplaced next, then the regiment of Estalian rodoleros (sword and buckler men). The orange and blue VMC colours fluttered above them, carried by the young ensign Anders van Rooven, a man of as worthy a descent as one could have in the city of Marienburg (his family being not only of noble blood but also very successful in their mercantile interests). By his side stood a Myrmidian priestess, the Tilean noblewoman Luccia la Fanciulla, whose presence much inspired the rank and file soldiers about her. They had found it very easy to embrace the god of war when her mortal agent took such an attractive form. Another saker broke up the line of foot, and then next stood Captain van Luyden’s company of shot, in which each man was also busying himself with preparing his handgun. The archmage Johannes Deeter, whiskered wholly in white while clothed entirely in black, stood with them. Unusually, he was not attended by his apprentice Serafina - she was inside the watchtower, sent to support that wing with whatever magics she could muster. Colonel van Hal’s Tercio, the ‘Meagre Company’, guarded the gate, consisting of a main phalanx of pike with two sleeves of shot. 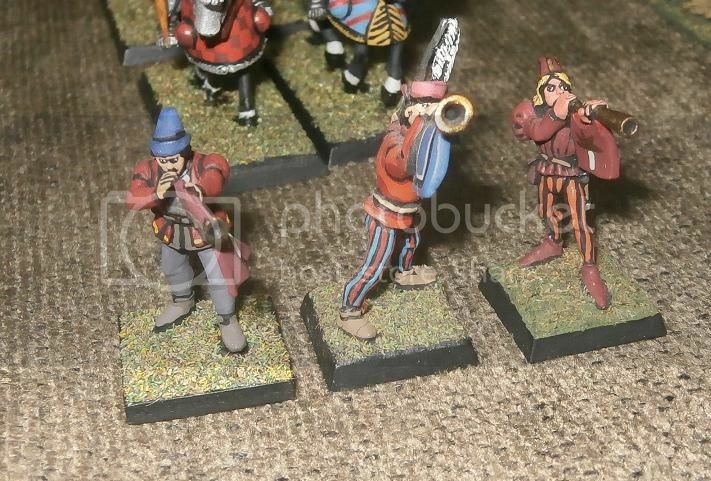 Unusually one of the little companies of shot stood in front of the pike, while the other stood at its side, flanked itself by a ribaudequin attended by the VMC’s Master of Works and artillery commander, Captain Singel. 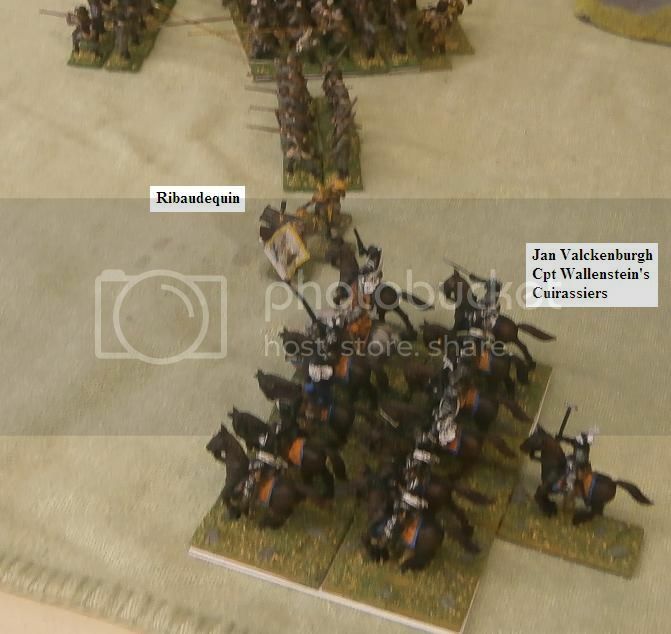 Out on the very far left flank was the army’s Lord General, Jan Valckenburgh, clad in black lacquered cuirassier armour, accompanied by Captain Wallenstein and his company of heavy horsemen. While their bred-for-war mounts snorted and champed at their bits, the riders spanned their wheel-lock pistols, knowing that they would without doubt be using them very shortly and so need not worry about weakening the springs. Their heavy maces, perfect instruments for bashing in thick, orcen skulls, hung from their saddles besides the pistol holsters. 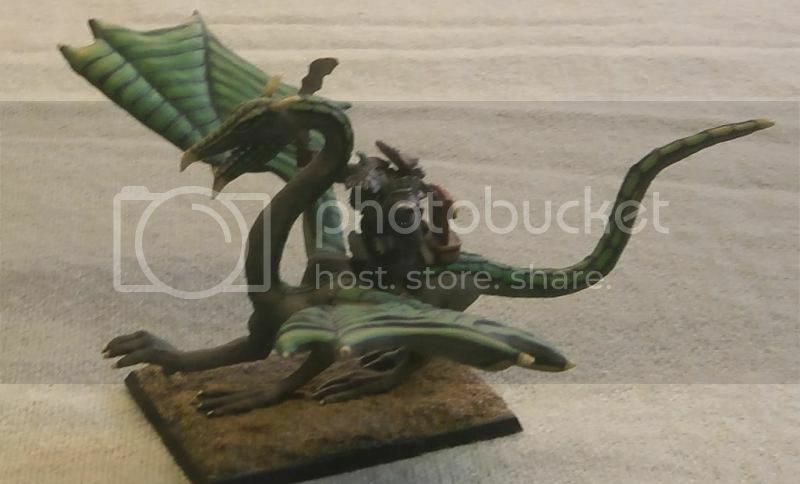 Warboss Khurnag, or ‘Mighty Khurnag’ as his own warriors called him, had chosen to ride his wyvern to battle the better to be seen by his boys, and to terrify the foe. Ever since he had refused to fly the beast over the walls at Monte Castello (in the knowledge of what the batteries of guns would do to the beast) there had been tittle tattle amongst his lesser servants, which had only the previous night been foolishly voiced within his earshot. The speaker was now dead – in fact he died only the merest moment after he realised, with horror, his mistake – but Khurnag’s pride had been dented. So now he sat atop his green-scaled, monstrous mount at the rear of his force, squinting against the afternoon sun to see just what in the way of guns this new foe possessed. 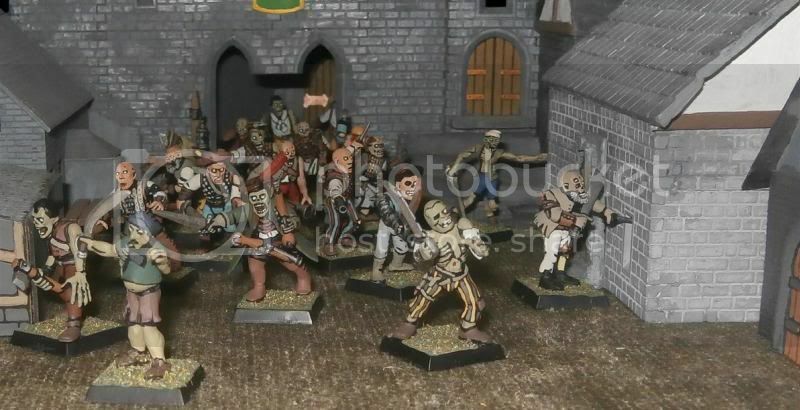 It seemed that the goblin big boss Gurmliss had not been exaggerating when he said that the army of Alcente was almost exclusively armed with black powder weapons. Not that knowing this would have changed Khurnag’s mind regarding his choice of mount, for if he was to regain the respect of his army and ensure they continued to call him ‘mighty’ then the wyvern was the only choice. Known only to him, and perhaps his mount, Khurnag did not like what he saw, and somewhere deep inside his raging mind there was a gnawing doubt telling him that he had made a mistake; a big mistake. 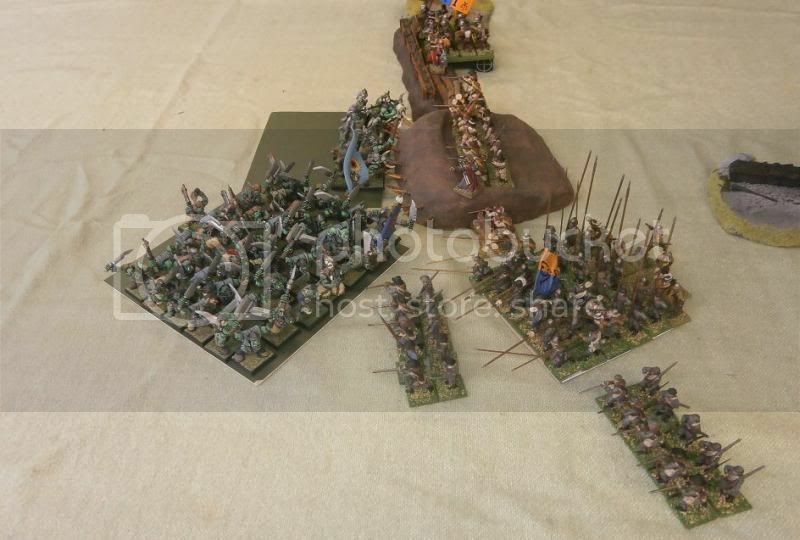 On the greenskin’s left flank, amassed there in the mistaken belief that the foe had deployed several bodies of horsemen outside the walls, were not only Khurnag, but two orc boar chariots, two bolt throwers, Khurnag’s three maneaters and almost eighty missile troops – arrer boyz and gobbos. Just the sort of troops to weaken then smash the enemy riders. If only the riders were still there. 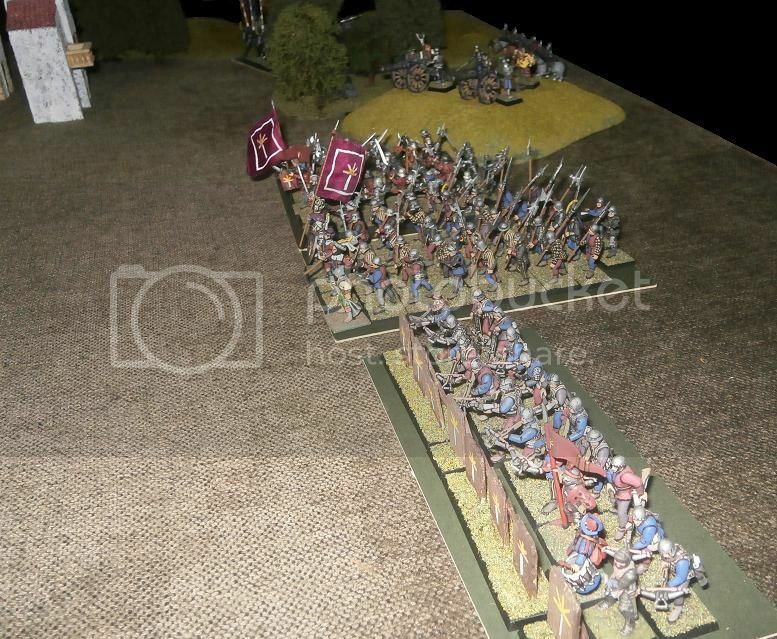 Now they faced only walls and a tower, manned by enemy handgunners and bowmen. 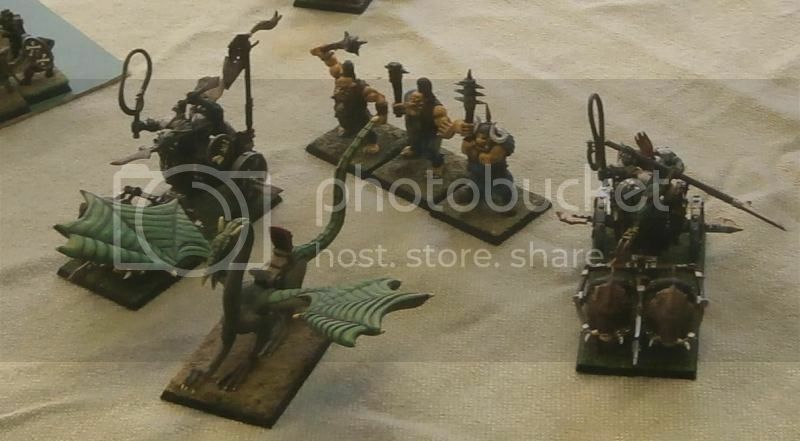 Not the ideal opposition for chariots and riders. 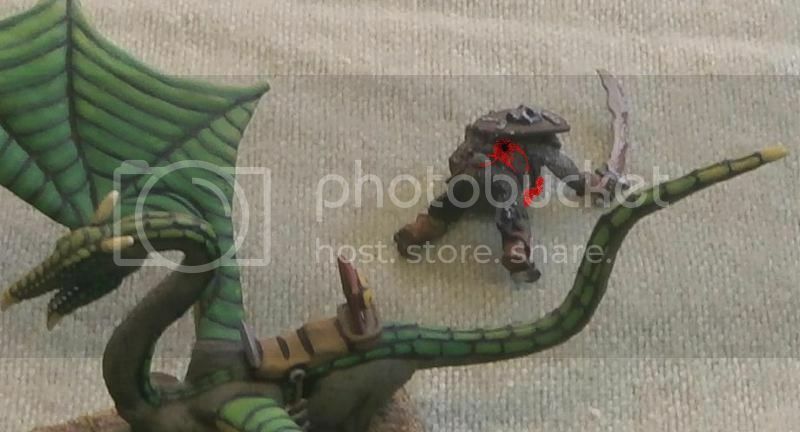 Luckily, the greenskin right, where the important hand to hand fighting would surely take place, was still surely strong enough to deliver a fatal blow. Nigh upon eighty orcs marched in two large bodies, with stone throwers ready to hurl huge rocks behind them. Boar riders and wolf riders came up on the far right, with wolf chariots and a pump wagon to add to the confusion they could create. Perfectly satisfactory, all in all, thought Khurnag. Or, more accurately, “It’ll do.” Once he had cleared this lot away from their piles of dirt and shiny tower, he could sate himself and his warriors with looting Alcente and all the settlements around. He gave no thought to what he would do after that, for he simply had not considered that far ahead, and right now his mind was filled with a lusty eagerness for battle. Hefting his heavy, serrated choppa, he prepared to give the sign to advance. As the orc warboss raised his choppa to give his signal, the men of the VMC were already touching slow match to powder to fire their two sakers directly at him. One cannon’s barrel shivered immediately, burning the crewmen to send them reeling from their bastion. But the other gun sent a six pound roundshot to tear a chunk of scales from the wyvern’s neck then plough right into Khurnag’s belly. Lifted out of his saddle, he was dead before he even hit the ground. A weak wave of magical summonations sputtered from the line of green, while a pair of huge stones landed with a thump nowhere near the men of the VMC and only one handgunner succumbed to the orcs’ first volley of arrows. 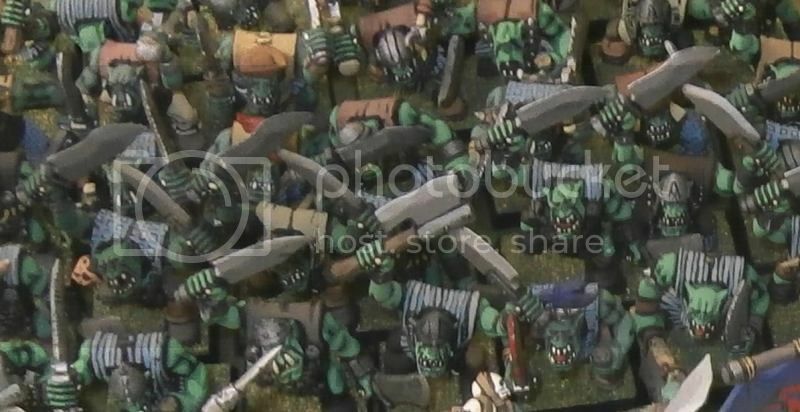 The little artillery piece the Waagh’s goblins had looted from Scabscar’s camp by the sea did kill three rodoleros, but this was the only real harm of any kind caused. Not that the greenskins were really trying yet – they were more concerned with closing the distance between themselves and the enemy. 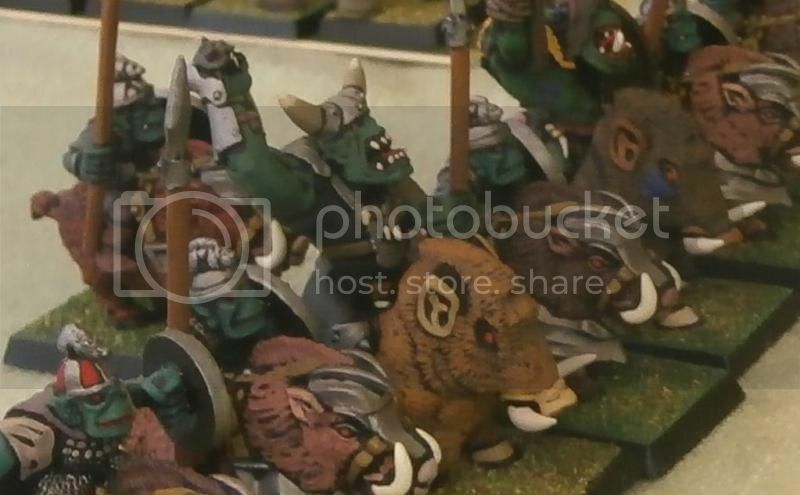 Most keen of all were Thagger the Spoiler’s boar riders, their pace matched only by the Waagh’s lone surviving pump wagon. On the greenskin’s left, the boar chariots, uncertain as to what or who they should charge, nevertheless rolled around either side of the maneaters, while the dazed but angry wyvern hopped over to land between them. Behind the defences no-one moved from their position. 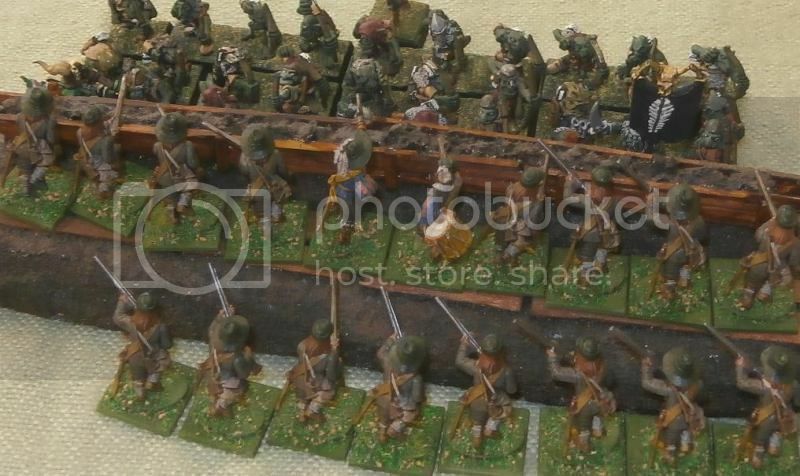 They were busy enough re-loading, and determined to launch as much lead and iron at the enemy as possible, then to meet whatever survived with a palisade to protect them. The wizards and priests of the VMC conjured a Net of Amontek upon Thagger’s boar riders, as well as killing one of the same with a Banishment spell. Pha’s Protection embraced several many of the defender’s units, while Shem’s Burning Gaze felled one unlucky goblin. Of course this was a mere taster, for now a hailstorm of arrow, bullet and ball burst outwards from the walls. 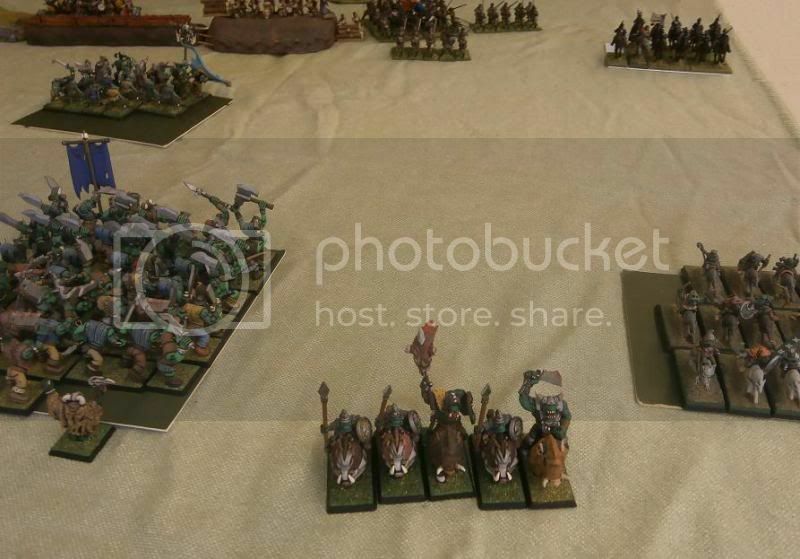 Goblins and orcs across the line fell, including half of the boar riders. Not everything went as the VMC intended, for their ribaudequin blew itself up and their saker shot simply buried itself into the earth. But the wizard’s ethereal dissipater shook the pump wagon to pieces, and the sight of this sent one of the wolf chariots fleeing from the field. What he had not reckoned with was the cruel power of the Net of Amontek. One of his boar riders was killed by its etheric barbs and none of the rest could free themselves from its grip. And they were not the only regiment that ground to halt. Someone in the massive regiment of orc boyz had already cracked a joke about Khurnag’s death (too soon, perhaps? ), and the ensuing mix of laughter and anger held them back as the rest of the army surged onwards around them (Game note: failed animosity). Once more the greenskin magic failed to get to grips with the foe, while the magical protection of a Banner of Respite meant that the stone throwers caused no harm either. Again only the goblin cannon caused any real harm, felling two of the heavily armoured cuirassiers with the VMC lord general. Perhaps to prove that they were not dismayed by such treatment, General Valckenburgh ordered his gentlemen to advance – being the only VMC unit to move. They then fired a pistol volley at the wolf chariot, their efforts boosted by the two detachments of handgunners to their right. The chariot did not have a chance. Witnessing its destruction, the goblin big boss Gurmliss was reminded of the very similar fate of the entire Little Waagh when it faced the VMC. His resolve, at least what remained of it after Khurnag’s demise, crumbled, and as he tugged at the fur of his wolf mount to halt the beast, the rest of his riders took this as a sign to shift for themselves, and so turned and fled away. 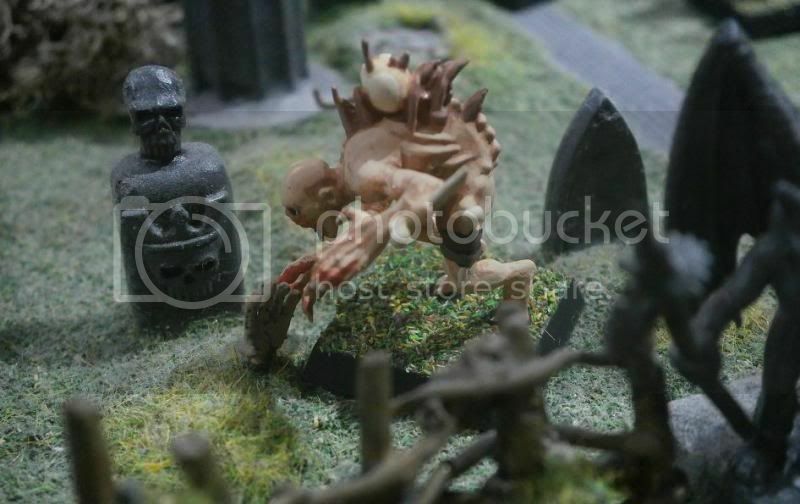 At last some of the greenskins were within potential striking distance of the foe – although nowhere near as many as they might have had if it were not for their tendency either to squabble or run away at the slightest provocation. 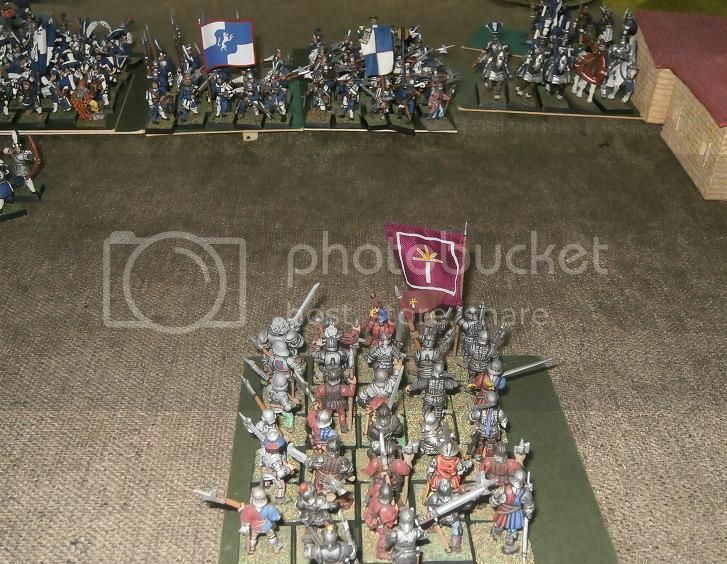 The smaller regiment of orcs, led by big boss Malkey the Fist, who carried the army standard, attempted to reach Captain van Luyden’s company of shot, but, whilst losing five of their number to a volley, they failed to do so. Only the goblin archers, breaking free of the magical net binding them, and losing four of their number in the charge, successfully reached the foe – hurtling themselves at the earthen bank upon which the grey coated firelock company stood. Thagger’s attempt to support this somewhat weak assault had already failed, for when his boar riders lost two of their number to the Meagre Company’s forlorn hope of hangunners, they turned and ran, pelting past the wolf-riders doing just the same to their left. Of course the goblin archers, although they did bring down several of the enemy, suffered at the hands of the VMC’s mercenaries, their attack much weakened by the fact that the foe was protected by substantial defences (Game note: No charge bonus and no rank bonus – home rules due to fact that these earthworks were something considerably more than a mere fence, being built with battle in mind.) No-one, not even themselves, was surprised when they fled. … most still had not realised that their cause was surely doomed. As General Valckenburgh’s cuirassiers turned a little, with equal calmness the garrison handgunners simply trotted back a few yards from the defences. 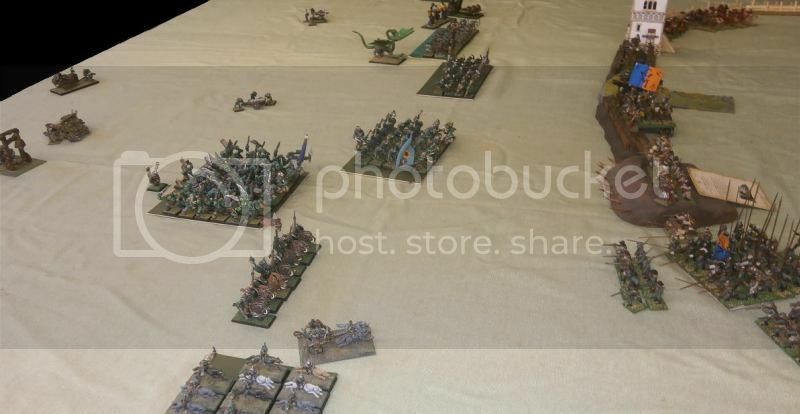 Two volleys of arrows laid low one of the Maneaters, while salvoes from the several companies of shot wounded another ogre, and brought down a smattering of orcs and goblins elsewhere in the Waagh’s now ragged lines. With a bellowed roar of frustration Thagger halted his last surviving riders. Next to him the wolfriders began bickering over what they ought to do next, with Gurmliss’ rather less loud voice lost amongst their chorus of shouts and insults. 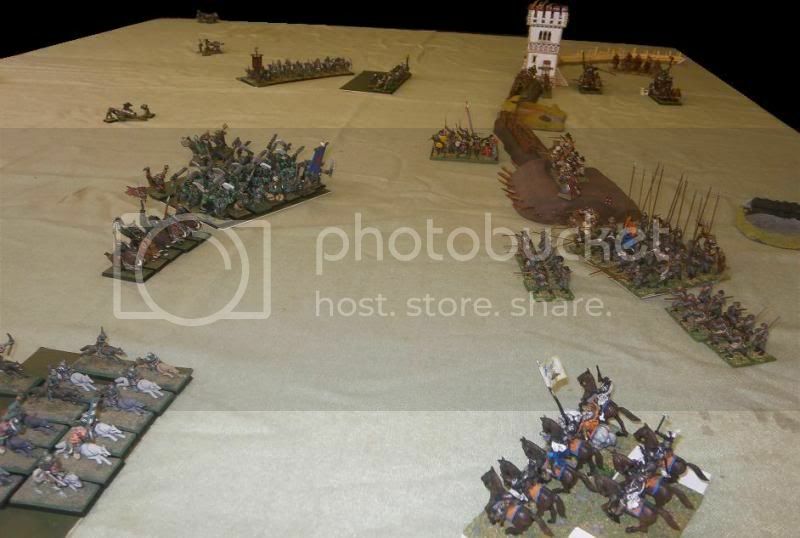 On the left of the greenskin line the last two maneaters charged the tower and set about hacking at the defenders. Both sides gave as good as they got and the very bloody assault resulted in the demise of the maneaters as well as five defenders. Nearby the boar chariots hurtled at the palisade, smashing through it, killing all ten of the archers defending it, then loudly rattling into the yard within. On the right, big boss Malkey the Fist led his boys into Captain van Luyden’s company of shot, losing four of their number to a handgun blast just as they began to climb the earthen bank. Big boss Malkey badly bloodied archmage Deeter, and the old man could do little but cower back and hope the men around him could defend him against further harm. With four orcs falling and one handgunner, the fight broiled on, with neither side yet ready to break. (Game note: -1 to hit as fighting over defences, no rank bonus) At their side the big mob of orcs moved up close to the foe, urged on by Big Mosher. 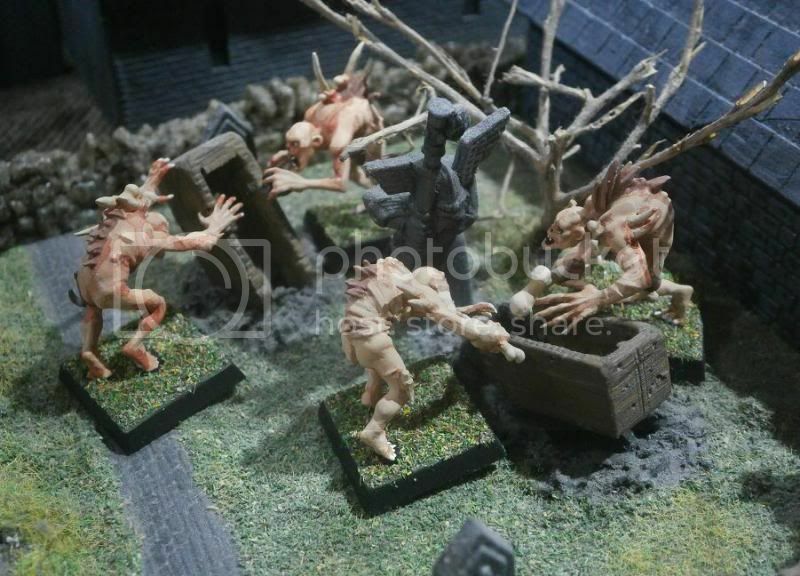 Once again the greenskins’ magic proved incapable of harming the men of the VMC, as their wizards channeled away its effects with dispellings and wardings. A huge stone crashed amongst the rodoleros, instantly killing five , yet they proved both brave and loyal, and simply reformed their ranks and files. 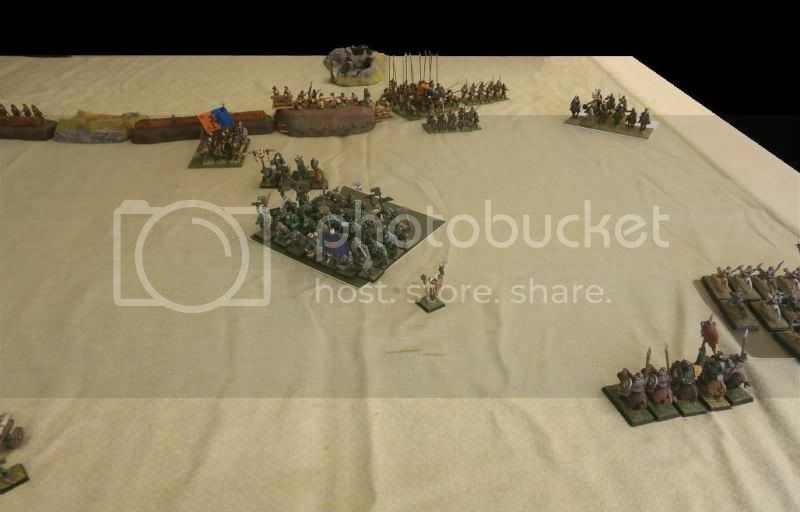 Now the rodoleros, champing at the bit for a fight and no longer willing to stand passively whilst dying to enemy fire, leapt over the barricades, the army standard of the VMC streaming above their heads, and charged into the flank of Malkey the Fist’s orcs fighting at the front of the bastion. 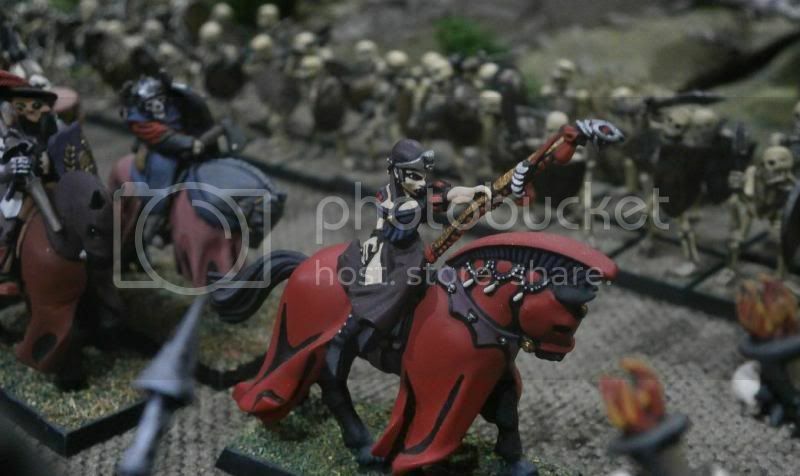 Unwilling to risk receiving a charge from the boar chariots, the tower garrison’s mounted handgunners did what such troops do best and galloped around the foe’s flank. The sound of gunfire came from the other side of the tower as the firelock guard felled another eight of the goblin archers they had just pushed from the wall. Out on on the VMC’s left the two detachments of foot handgunners combined their firepower with the cuirassier’s pistols to cut down ten of Big Mosher’s orcs. (Game note: 10 was not quite a quarter of their strength, they needed 11!) Big Mosher grinned, for at last – at long last – he was about to draw the enemy’s blood. He raised his choppa and gulped in the breath necessary to bellow the order to charge. But it was not to be. For in that instant, Malkey’s orcs, battered to a pulp by the foe attacking them on two sides, unable to surmount the defences, finally broke and fled. 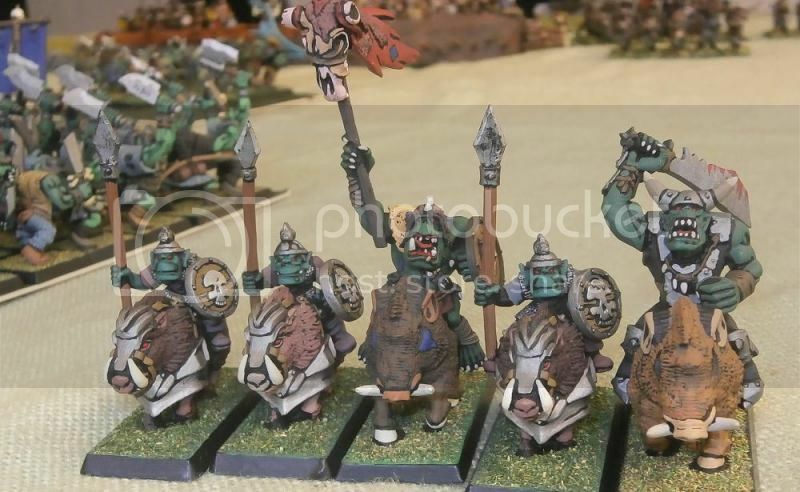 And as they did so, Big Mosher’s orcs joined them. 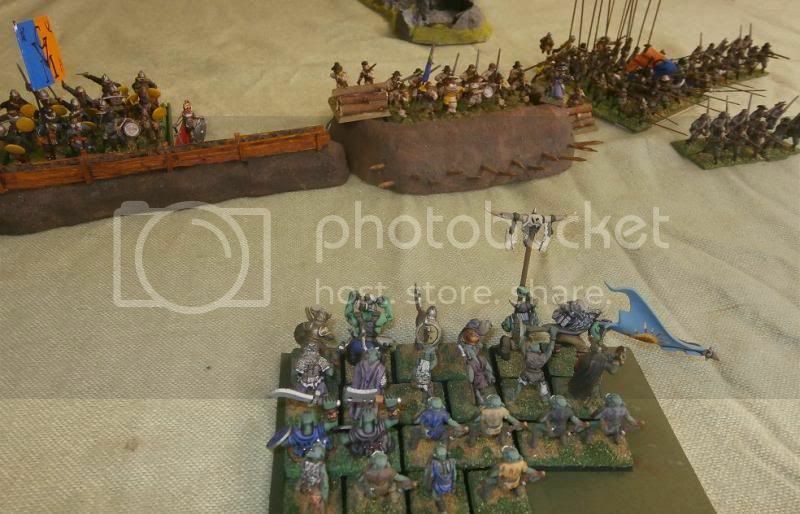 It was the beginning of the end for the greenskins, although one might argue that had happened upon the very opening shot of the battle when Khurnag fell. 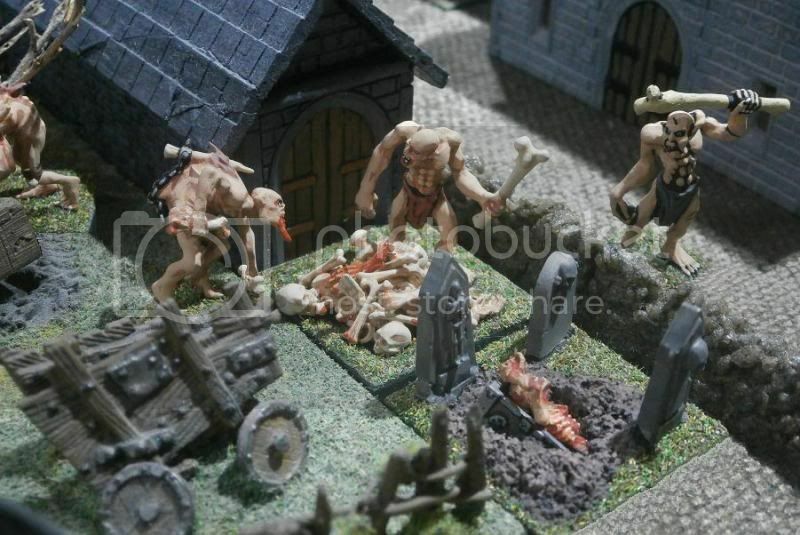 As the goblin archers set to squabbling among themselves over who got what from their fallen comrades, Mosher’s boys rallied. … turned and climbed back over behind the defences. Then one by one, the warriors of Khurnag’s Waagh began to fall back, most in silence. Their ears rang from the umpteen thunderous black powder volleys that had been launched in their direction, their skin being peppered by splinters of bone and teeth torn by leaden bullets from the bodies of those once standing with them. … until one was run down and destroyed by the enemy horsemen. The other careened around and smashed its way back out of the enemy’s camp, taking the firelock company with them! 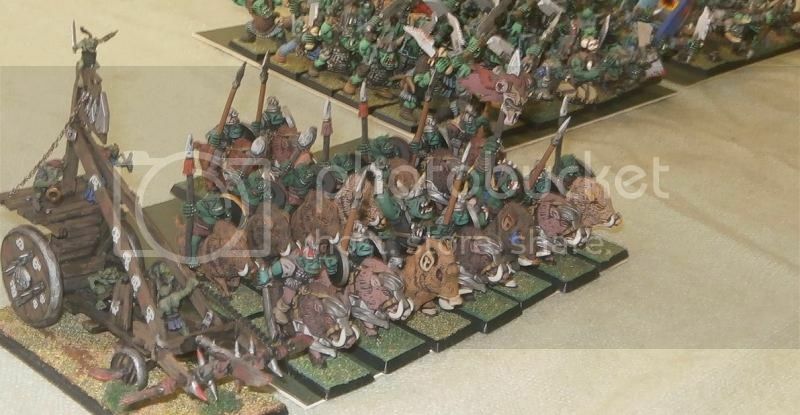 As the fleeing handgunners skittered about to avoid the chariot’s scythes and its draught animals’ tusks and hooves, the rest of the soldiers of the VMC simply watched as the greenskins withdrew – after having reloaded once more just in case some madness caused the warriors of the Waagh to try one more assault. 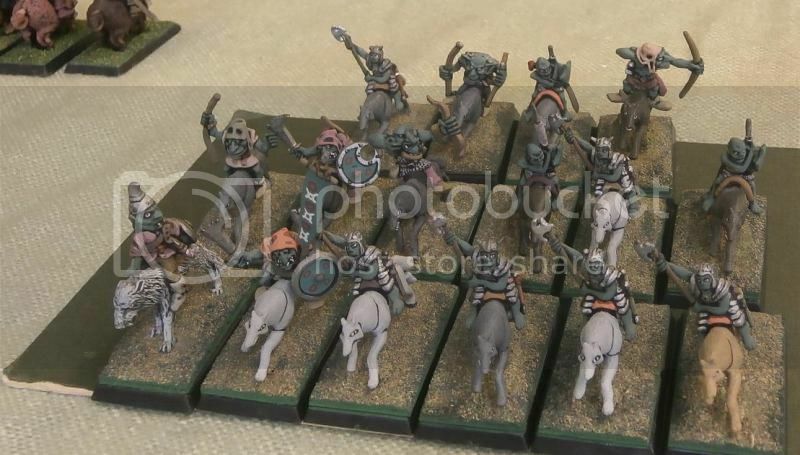 Gurmliss wandered if they were a Waagh at all anymore, if Khurnag was no longer leading them. Big Mosher, meanwhile, wondered whether he could fashion them into his own Waagh, but then immediately began to ponder whether he wanted such a broken force. The VMC’s drums and horns sounded, the handgunners let loose a salute to victory, to be joined by cheering from all across the walls. 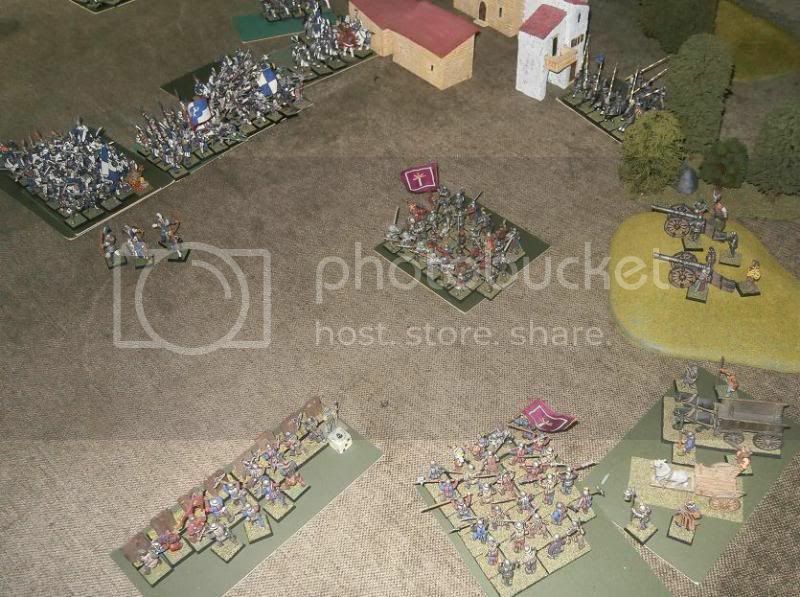 The Meagre Company’s pikemen couldn’t believe that the battle had been won without them having to engage anyone, but cheered all the harder for it. And General Valckenburgh rode through his men to give and accept salutes, to offer and receive praise, and generally to revel in the defeat of such a mighty foe. I hereby address all Tileans, whether noble or common, rich or poor, young or old. You can tarry no more, nor is there even time to pray, for a doom is upon each and every one of you, and all that you hold dear, indeed all else, will be destroyed if you do not act. Not soon, nor later, nor ‘by and by’, but now, this very day. In summer I spoke to you concerning the dire threat in the north, and demanded that all faithful servants of Morr and every lawful god must immediately take up arms to join in the stand against the undead. I instructed all city states and rulers to put aside any differences so that they march forth together to end the terror before it devours us all. Yet my words were not heeded, and the brave people of Viadaza stood alone against the foe. Such was their fearless faith that they were victorious in battle, and yet still their city fell - for the foe is numerous, many and more, and will rise to fight again and again unless beaten utterly, their bones broken and burned. And what does Tilea do? Even now wars are being fought over petty matters of trade and pride, concerning who governs this and who owns that, while still others languish in either indolence or ignorance believing they cannot be touched by the evil that has swallowed the north. If this evil is not defeated, then there will be no rest eternal for anyone of you. Instead of peaceful repose in Morr’s garden, you, your family, your friends, all those you love, all those you know, will become corrupted, tortured and enslaved to the will of a vampire. This is no idle speculation, nor mere presumption, for this is exactly the fate of almost all those who only last year lived in the realms of Miragliano, Ebino and Viadaza. And still the evil grows, engulfing more and more of Tilea. By the seal ‘MMM, in full agreement with High Priest Flavio Tognazzi of the Holy Church of Mercopio and Arch Priest Luccino de Sicca of the Holy Church of Myrmidia, I hereby declare a Crusade against the wickedness in the north. Each and every able bodied, free Tilean is to muster immediately in arms to be guided by our priests, assembling armies sufficient to save our realm. 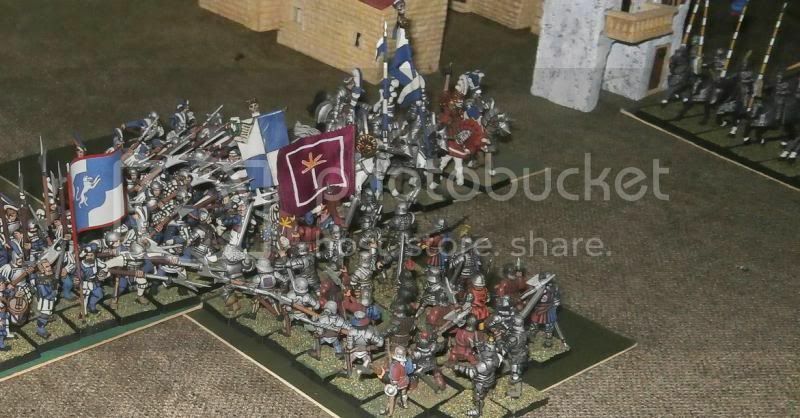 Every ruling prince or council must do all they can to support this cause, mustering all militia and soldiers available to them in order to support the crusade (keeping only those forces vital to the safety of their own realm) and providing all necessary supplies to maintain those forces in the field. Furthermore, every prince and council is ordered for the greater good of the entire realm as well as in dutiful obedience to the will of the gods, to respect their neighbours, cease all petty squabbles and actions, and allow free passage of all crusading forces to either Remas or the north. Even now … (Here, in the speech he himself delivered, the archlector added ‘you’) … the men of the city state of Remas are girding arms. The city’s bells ring before dawn each day so that men may wake and gather to practise their postures. Let no other city or town, nobleman or militiaman shirk this duty. Prince Girenzo of Trantio had never intended to ride to battle with so few men. He had hired the best mercenary company in Tilea to fight for him, and if it proved necessary that he also himself fight, he expected to command a mighty army made of both his own soldiers and all those he paid for. Not now, however, for despite their promises that a raid against Pavona would be easy, the mercenaries of the Compagnia del Sole were close to failing him. After a hesitant start, they had eventually begun the work of looting and burning with vigour. Their initial delay, however, meant lingering just a little too long in the enemy’s territory and they had been caught. Now they had been very badly mauled in battle and were being pursued back towards Trantio, slowed down so much by their precious haul of plunder that they were very unlikely to reach it. As a consequence, Prince Girenzo’s hand was forced: either ride to their aid or lose the mercenaries and their plunder. Now it had come to open war, he needed both, which meant he had to choose the first option, no matter how risky it was. Still, there was every reason to be optimistic. The relief column he now commanded consisted of men he could trust. He himself had overseen their thrice-weekly drilling in the fields outside his city walls, recognising both their competence in arms and their dedication to their service. The only thing he did lack was numbers - paying the mercenaries had drained his coffers. One unsubtle solution to the meagreness of his forces, an idea suggested by the commander of his gentlemen, Sir Gino Saltaramenda, was to sound much larger. Prince Girenzo had mused that it was more the sort of tactic an orc would use than the kind of strategic cunning an Myrmidian Tilean warrior might bring to bear. Sir Gino had replied that the enemy were only men, and that nervous ears could befuddle scouts and unsettle the enemy. In the end the prince had agreed. It would cost nothing. If it made no real difference, then there was no real loss. So it was that at the head of the army three foot-soldiers marched with brass horns blaring out shrill notes as harmoniously as they could. It was not the most awe-inspiring of sounds, but when mixed with the tooting call of more horns further behind, and the rolling, petty thunder of myriad drums, it gave exactly the impression Sir Gino had suggested it would. The Prince had to admit that were he squatting upon the other side of the hill, afraid to come too close for fear of being spotted, he might indeed surmise that a vast horde of many regiments was marching along the road. Behind the trill-trio vanguard rode Trantio’s gentlemen at arms, led by the prince himself and his captain Sir Gino. The Medizi family coat of arms was emblazoned upon the white flag born by the company: a golden crown, chain and shield sporting blood red spots and fleurs-de-lys. The yellow and purple feather piled thick and high upon the standard bearer’s helm added suitably to the impression of royal authority. The old prince had been little like his son, for although he ruled his subjects as a tyrant, with his own family he was prone to long winded pronouncements over the most petty of matters whilst countering serious questions with jests and tomfoolery. It was a species of bravery, Girenzo had no doubt, but it was not for him. Nevertheless, in the case of the talisman his father was not merely jesting, for Prince Girenzo had examined witnesses and learned that if anything his father was playing down its power. The prince now wondered whether today was his own, first ‘risk too many’, a thought that soon turned into worrying whether the magical power bound up in such a thing might wane over time, until settling upon doubts that it could possibly work against bullet or ironshot. His father had only spoken of blades. Of course he showed not the slightest hint of his concerns. Those who looked upon him would have presumed him to be lost in idle, almost careless thought, and certainly not troubled by the consequences of the imminent fight. Behind the prince and his gentlemen marched the foot soldiers, first being a large regiment of the city’s militia, every man bearing the pike he had practised with time and time again. At their head they carried two standards: the army’s battle standard bearing the Medizi coat of arms bordered in yellow, and their own standard bearing the emblem of Trantio – a red fleur-de-lys prettified up with curlicues and flourishes. Of course, not one but two drummers beat the march at their fore. At the rear marched a company of crossbowmen, part of the Compagnia del Sole who remained in Trantio while the rest wait upon the raid. They too had a drummer, but just as loud were their conjoined voices, sending the words of their soldiers’ bawdy songs echoing round the hills. Between them and the pike trundled the Compagnia’s horse artillery, which one might suppose ought to have gone with the raiders, but Prince Girenzo wanted it to hand to be dispatched quickly to wherever it was needed. The gunner was a dwarf, mounted on a pony, while his two mates rode the lead pair of draught horses. Special rules: Hold the Line. 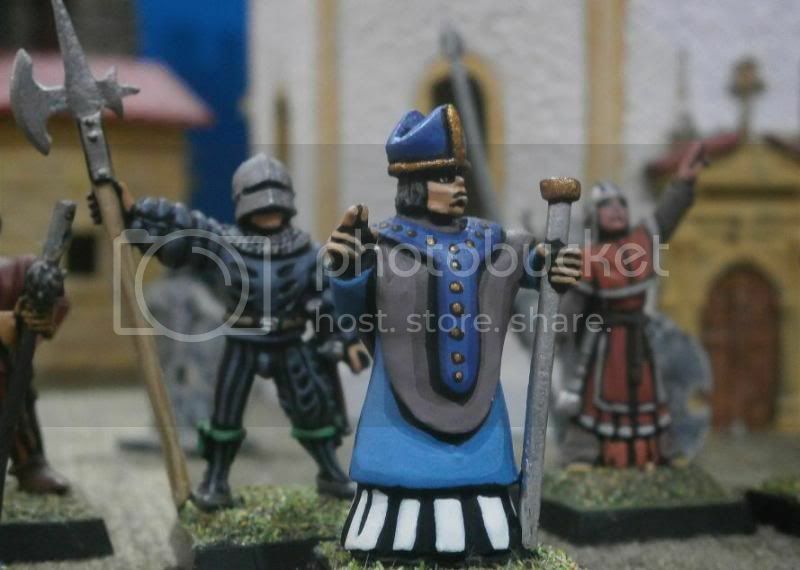 Condotta Captain 84 pts; Mercenary skill - Hopelessly stubborn: Character, & any unit he joins, is stubborn. Horse Artillery 85 pts; 1 machine, 3 crewmen. As cannon, except range 24“, S7 & causing d3 wounds. Grapeshot S4, armour piercing. Cannon & crew can move 8”, can march, & can even move & fire (tho’ not march & fire). May flee charges, even tho’ war machines may not usually do so. May not stand & shoot.